I’m delighted to introduce you to my featured guest today: Jennifer Jewell, creator and host of Cultivating Place: Conversations on Natural History and the Human Impulse to Garden. Cultivating Place plays a significant role in the audio space, not just on North State Public Radio in Chico, California, the show’s home base, but everywhere through the power of Podcasting. 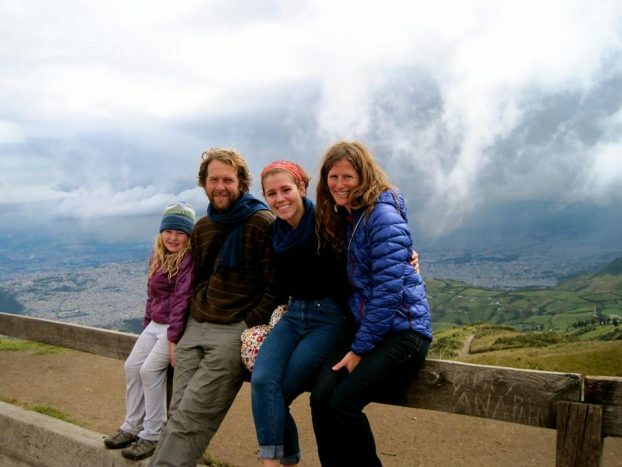 I know many of our Slow Flowers Podcast listeners have already discovered Jennifer and this wonderful one-hour weekly program — in fact, Jennifer and I are frequently drawn to the same guests and topics. 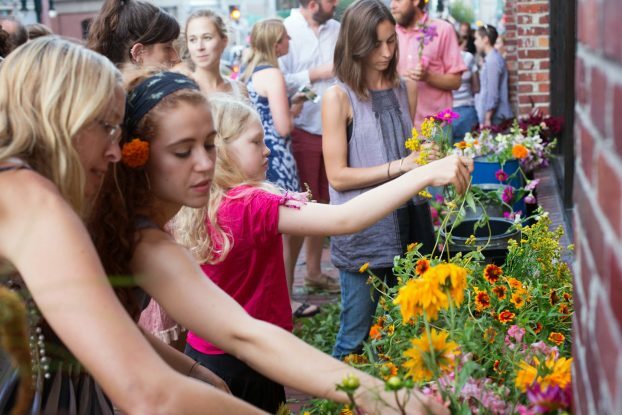 Cultivating Place is an incredible platform for dialogue with people for whom nature and gardening is a central, essential act. 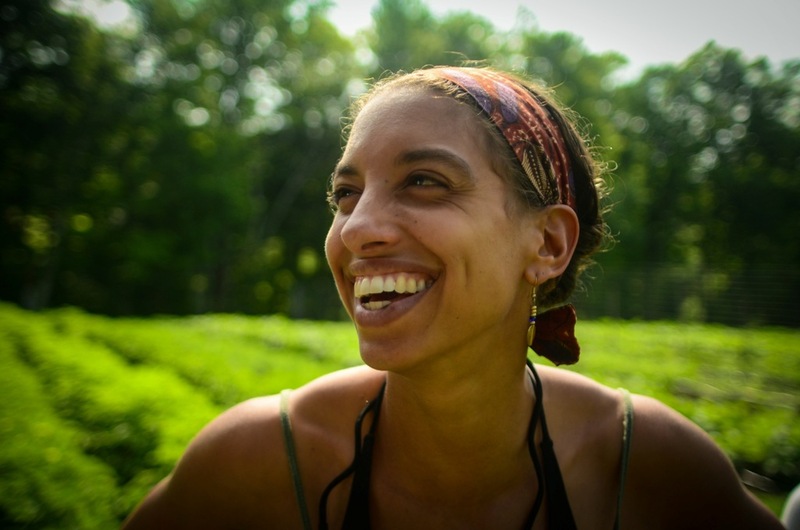 Jennifer is passionate about conversations that often include the simple question: What is your garden practice? Here is more about Cultivating Place. The program’s premise is that gardens are more than collections of plants. Gardens and Gardeners are intersectional spaces and agents for positive change in our world. 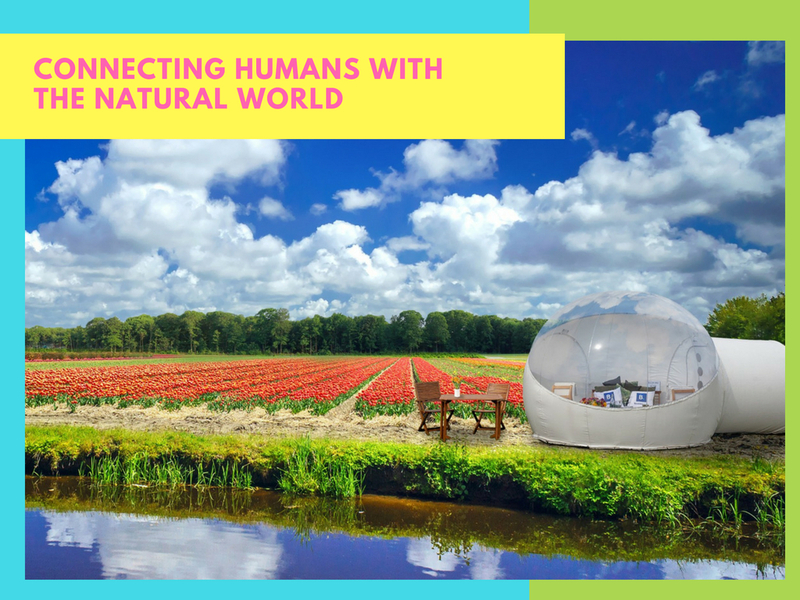 Together, we center gardens and gardeners as paradigm shifters improving our relationships to and impacts on the more-than-human natural environment, on the larger culture(s), and on our communal and individual health and well-being. Through thoughtful conversations with growers, gardeners, naturalists, scientists, artists and thinkers, Cultivating Place illustrates the many ways in which gardens and gardening are integral to our natural and cultural literacy – on par with Art, Science, Literature, Music, Religion. Gardens encourage a direct relationship with the dynamic processes of the plants, animals, soils, seasons, and climatic factors that come to bear on a garden, providing a unique, and uniquely beautiful, bridge connecting us to our larger environments — culturally and botanically. With 38% of US households engaging in gardening – we are many, and especially together, we make a difference in this world. 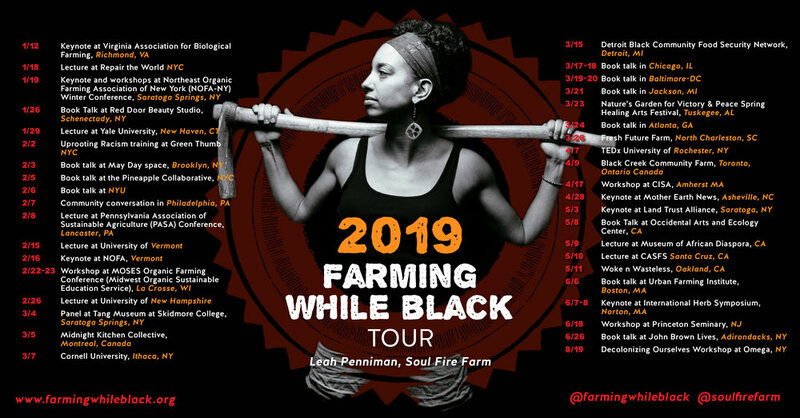 These conversations celebrate how all these interconnections support the places we cultivate, nourish our bodies, and feed our spirits. 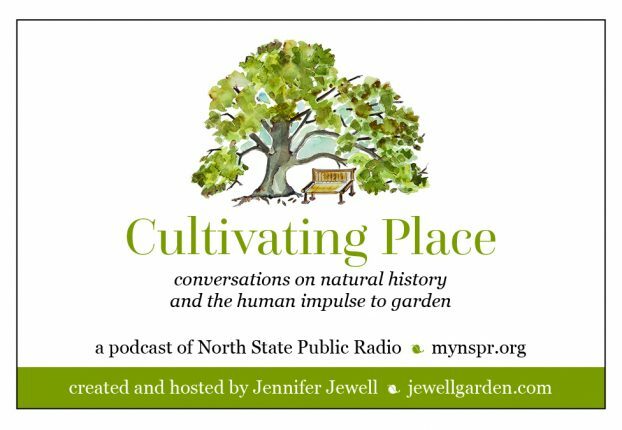 Host of the national award-winning, weekly public radio program and podcast, Cultivating Place: Conversations on Natural History & the Human Impulse to Garden, Jennifer Jewell is a gardener, garden writer, and gardening educator and advocate. 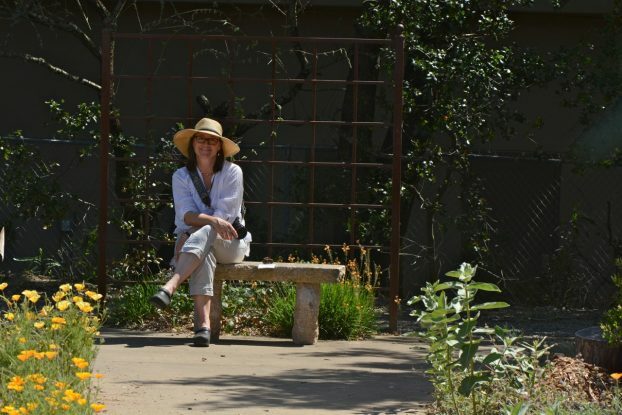 Particularly interested in the intersections between gardens, the native plant environments around them, and human culture, she is the daughter of garden and floral designing mother and a wildlife biologist father. 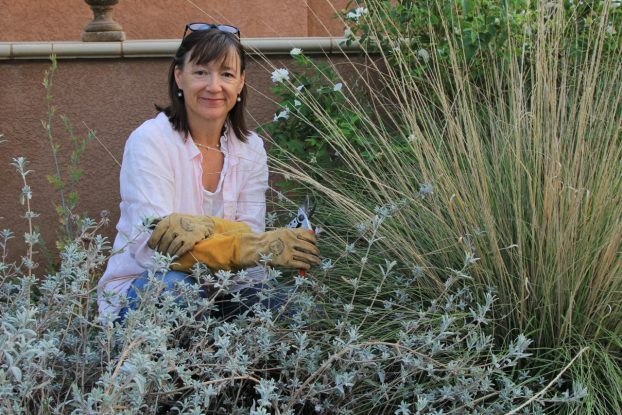 Jennifer has been writing about gardening professionally since 1998, and her work has appeared in Gardens Illustrated, House & Garden, Natural Home, Old House Journal, Colorado Homes & Lifestyles, and Pacific Horticulture. 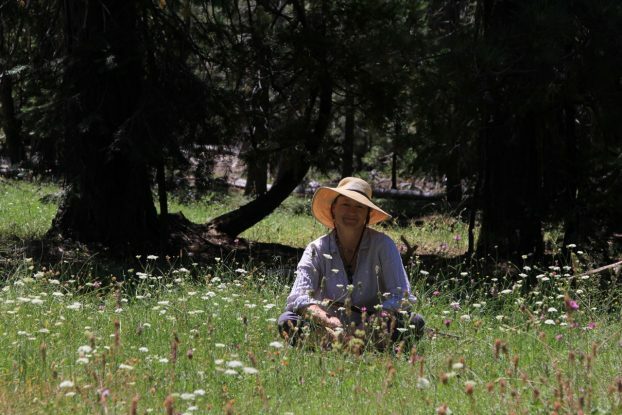 She worked as Native Plant Garden Curator for Gateway Science Museum on the campus of California State University, Chico, and lives and gardens in Butte County, California. Jennifer’s first book about extraordinary women changing the world with plants, is due out in early 2020 from Timber Press. I’m so honored that she asked me to be part of this project as one of the women profiled — and in the coming months, I’ll have more details to share with you. 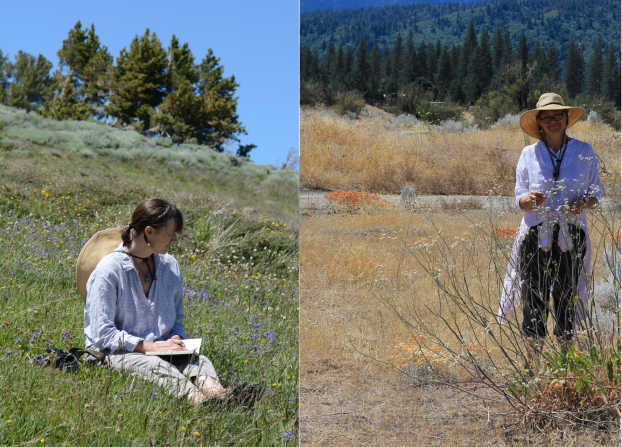 She is currently at work on her second book highlighting wild gardens of the west and their relationship to the natural beauty of their places, with photographer Caitlin Atkinson. 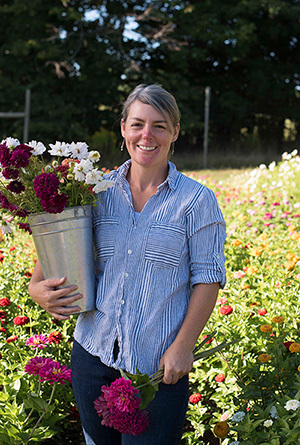 Amy started out about 8 yrs ago as a farmer’s market vendor selling cut flowers surrounded by garden foliage; now everything she grows supplies her weekly business. Establishing relationships with small & large business owners comes naturally to Amy, a former marketing director at the Indianapolis Chamber of Commerce. 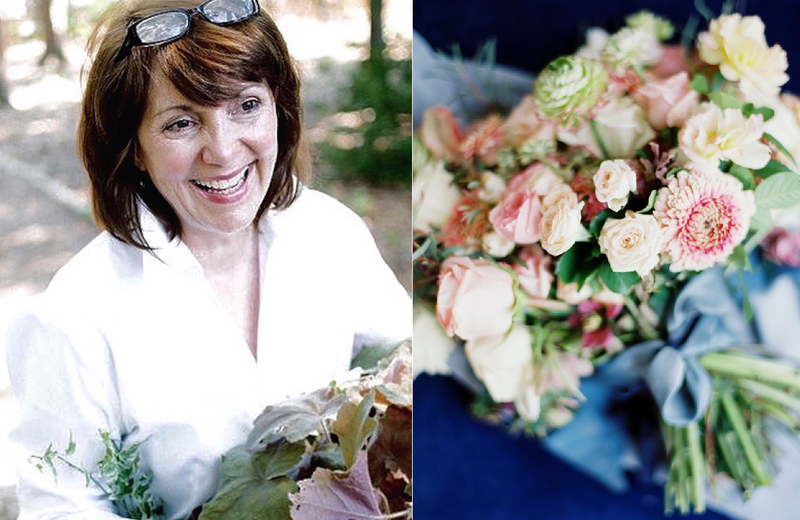 When she personally delivers weekly flowers it’s a weekly highlight to catch up with customers, including a 13-room boutique hotel, an all-organic restaurant, artisan icy pop shop, an international brand retail store, and a senior living facility. 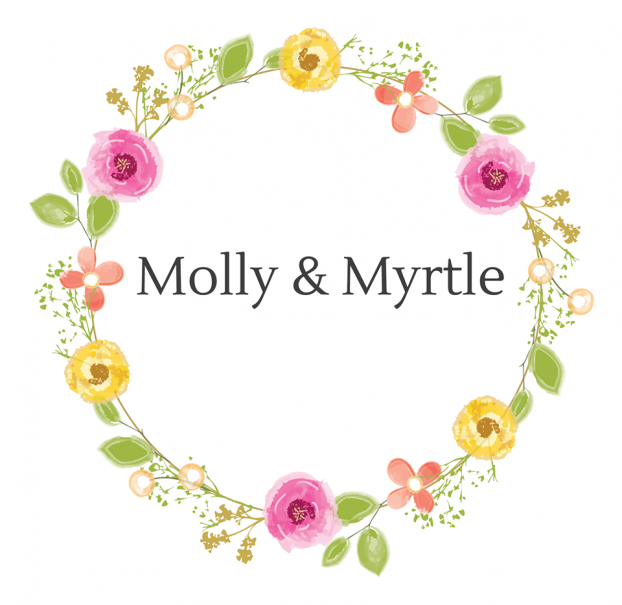 Molly & Myrtle’s bread & blooms so to speak are weddings, in addition to workshops, special events & philanthropy. 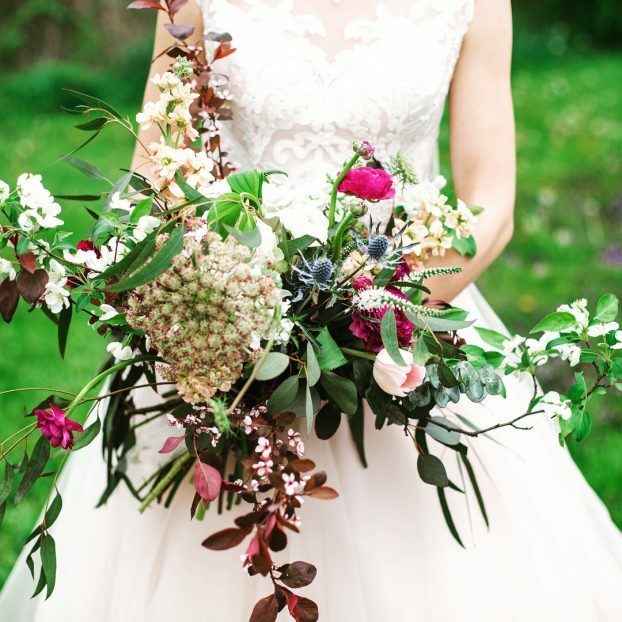 A local and seasonal bridal bouquet designed by Amy Beausir of Molly & Myrtle in Indiana. “I was born in the small town of Cary, Illinois, and my childhood provided an idyllic environment for a kid and priceless experiences stored away have given me channels of inspiration for a grown up designer. 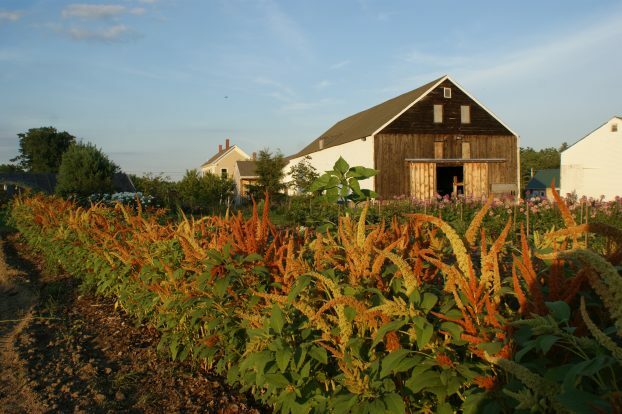 The glacial region supplied rich black dirt, and on our property, manure from a Hertz family Kentucky Derby winning race horse and then Curtiss Farms prize bulls made our family garden flourish. “A special neighbor named Louise was a conservationist ahead of her time. Louise and a few helpers built a wildflower trail down the hill from us off Turkey Run Rd. Louise carefully marked the solomon’s seal, trillium, trout lilies, and dozens of other specimens that lined the forested trail that finished at the beginning of a group of natural spring fed trout ponds. I learned how to make watercress sandwiches & candied violets from foraging “small servings” from the woods & wildflower trail. Thank you so much for joining me today, and I’m so pleased to share the stories and voices of Jennifer Jewell and Amy Beausir — they’re both contributing exciting chapters to the Slow Flowers story and I hope you find and follow them! Thank you so much for joining me on this Slow Flowers journey as I seek new and inspiring voices, people with passion, heart, commitment and expertise to share with you. I hope today’s episode gave you at least one inspiring insight or tip to apply to your floral enterprise. What you gain will be multiplied as you pay it forward and help someone else. 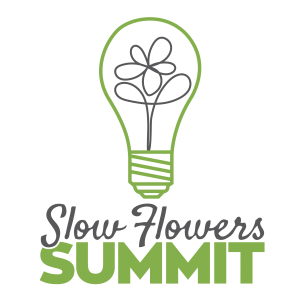 The Slow Flowers Summit is coming up soon — on July 1 & 2nd in St. Paul, Minnesota. More than half of the registration slots have been grabbed, so don’t miss out on this opportunity to join with Slow Flowers thinkers and doers in person. The Association of Specialty Cut Flower Growers. Formed in 1988, ASCFG was created to educate, unite, and support commercial cut flower growers. It mission is to help growers produce high-quality floral material, and to foster and promote the local availability of that product. Learn more at ascfg.org. 1. Take a photo of something that’s currently blooming in your garden. Show us one flower, 100 flowers or a bouquet — you decide. 2. 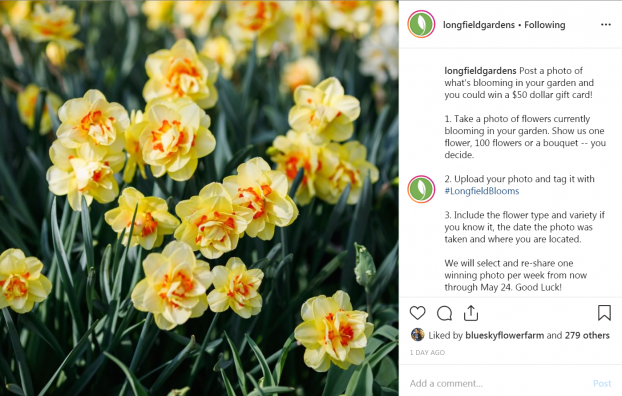 Post your photo on Instagram and tag it with #LongfieldBlooms. On Facebook, leave it as a comment under our weekly post. 3. Include the flower type (and variety if you know it), the date the photo was taken and where you are located. We will select and re-share one winning photo each week from now through May 24. Good Luck! The Slow Flowers Podcast has been downloaded more than 444,000 times by listeners like you. Thank you for listening, commenting and sharing – it means so much. Thank you all! Mimo Davis and Miranda Duschack of Urban Buds. Today, we return to St. Louis, Missouri, to check in with the dynamic duo, Mimo Davis and Miranda Duschack of Urban Buds. 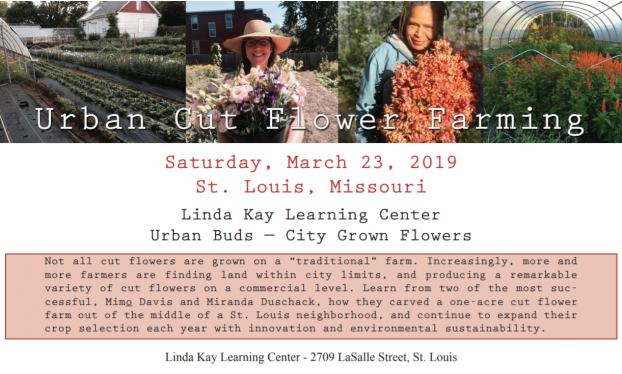 Not only will you hear more about their farm’s expansion news, I especially wanted them to share highlights of the upcoming Urban Farming Conference that they and others have organized as a program of the Association of Specialty Cut Flower Growers. Every other year, ASCFG has a large annual symposium, such as the Raleigh conference last year. Then, during the alternating years, such as what’s happening during 2019, ASCFG produces several topic-focused sessions in regions around North America. Later this month, on Saturday, March 23rd, the second such event of the year heads to St. Louis. You’ll hear a preview of some of the presenters and their topics covered at this one-day event, which includes a panel presentation from Mimo and Miranda and owners of two other Missouri flower farms — all about the results of their research and trials on Winter production. There will also be a tour of the local floral wholesaler, Baisch & Skinner, and a farm tour at Urban Buds. 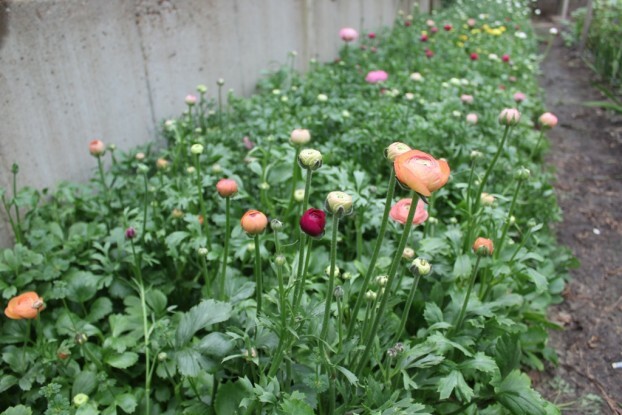 Fresh, local, sustainable and beautiful ranunculus, grown in the heart of St. Louis at Urban Buds. 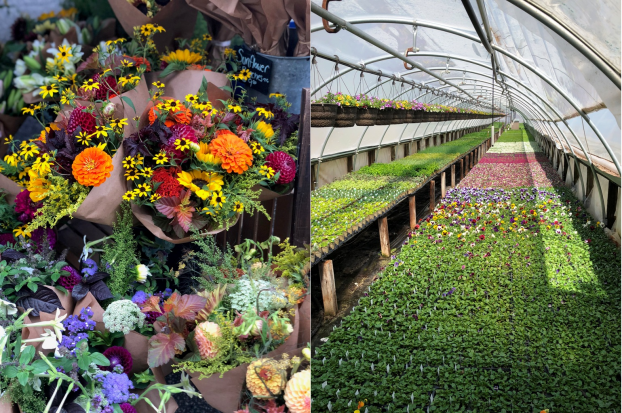 Spring will have barely arrived outdoors, but inside the greenhouses and high tunnels at Urban Buds, beautiful seasonal flowers will be on full display. I’m excited for the attendees — the city farm is a sight to behold and proof that a flower farm can be just as successful on small plots as well as on larger acreage. Here is a link to the ASCFG Urban Farming Conference details, including registration and lodging. Here is a link to my 2016 Slow Flowers Podcast interview with Mimo and Miranda, Episode 238. 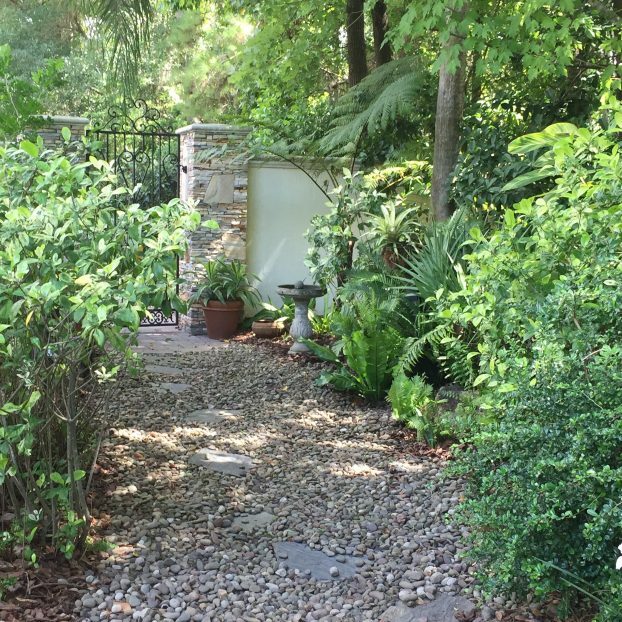 Our theme for 2019 – Fifty States of Slow Flowers – continues today, with Kate Read of Grey Tabby Gardens in Lake Mary, Florida. Grey Tabby Gardens, where Kate Read lives and grows her beautiful, English-inspired cut flowers. 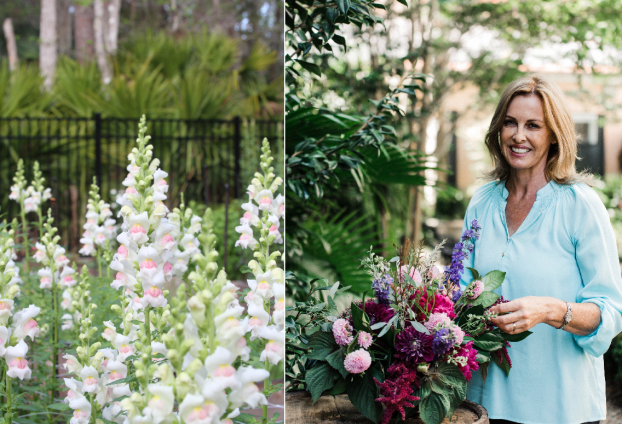 Kate grew up in England and brings a love of English gardens with her wherever she lives, including Florida, which she has called home for 18 years. The flowers that are grown at Grey Tabby Gardens are nurtured from seed to bloom and are tended using responsible practices. They have been naturally grown without the use of toxic chemicals or synthetic fertilizers and have been happily visited by bees, butterflies and hummingbirds. Thanks so much for joining me today. I’m just back from the Philadelphia Flower Show where my mind was fully blown, not only by the warm welcome shown to me on the Designer’s Studio stage, where I presented the Slow Flowers story through flowers, but also by the once-in-a-lifetime opportunity to see and cover the FTD World Cup floral competition. Twenty Three countries sent a designer to compete on the world stage and over the course of three days, tens of thousands of flower show attendees witnessed the highest level of talent in real time. I’ll be writing about the competition for Florists’ Review and Canadian Florist, so you can read more about it in the near future. Suffice it to say, there is some kind of new dynamic, new energy being infused in the profession of floral design, especially here in the U.S., where florists of all stages of experience and style are inspired to elevate their craft and art to new levels. Congratulations to all the remarkable FTD World Cup competitors — you are the cream of the crop — and special congratulations to Australian floral designer Bart Hassam for winning this international floral competition. I’ll have a link to beautiful images and videos from the World Cup in today’s show notes — you must take a look and drink it in. The Slow Flowers Podcast has been downloaded more than 422,000 times by listeners like you. Thank you for listening, commenting and sharing – it means so much. Thank you all! 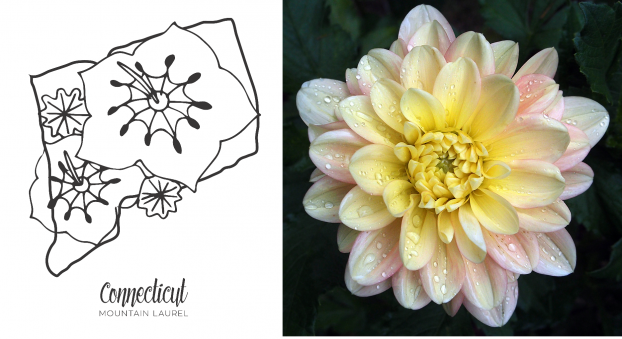 Our theme for 2019 — Fifty States of Slow Flowers — continues today with Connecticut. 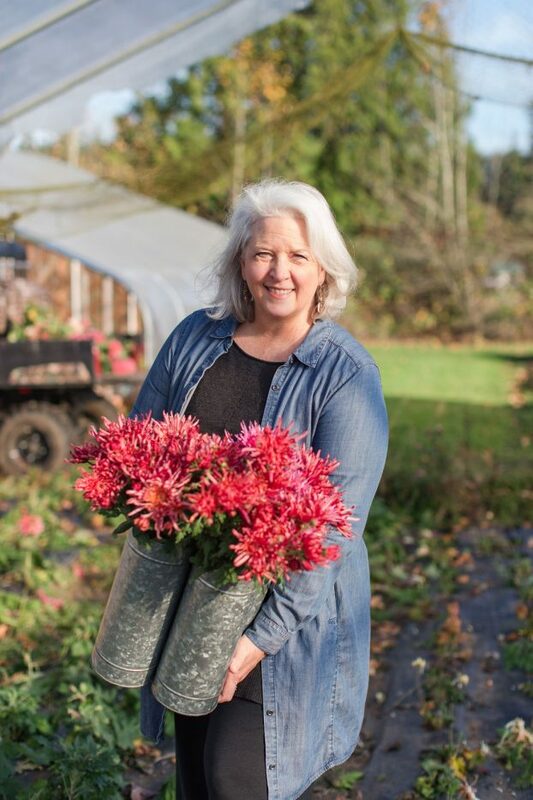 And because I was so wrapped up in the conversation I recorded with my guest, Evelyn Lee of Butternut Gardens, this is an extended State-Focus episode. 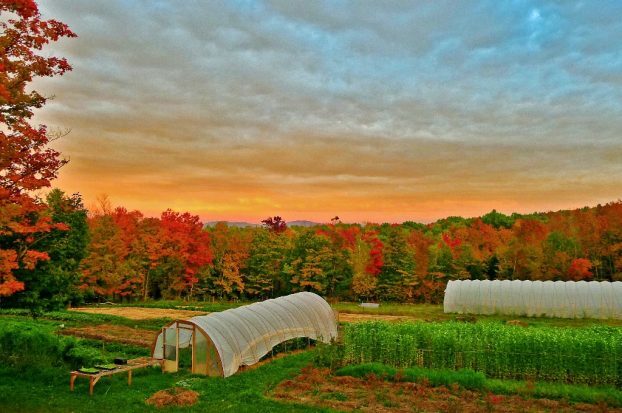 A lot of exciting flower news is coming out of Connecticut and I’m glad we took the time to discuss it to share with you. Evelyn joined Slow Flowers several years ago and I’ve enjoyed meeting her on a few occasions, including last year’s Slow Flowers Summit in Washington, D.C. I also interviewed her for a farmer-florist article a few years ago. Ironically, that article appeared in Southern Farm & Garden magazine, and while Connecticut isn’t exactly “the south,” the editors loved her story. Here’s a link for you to read the article. 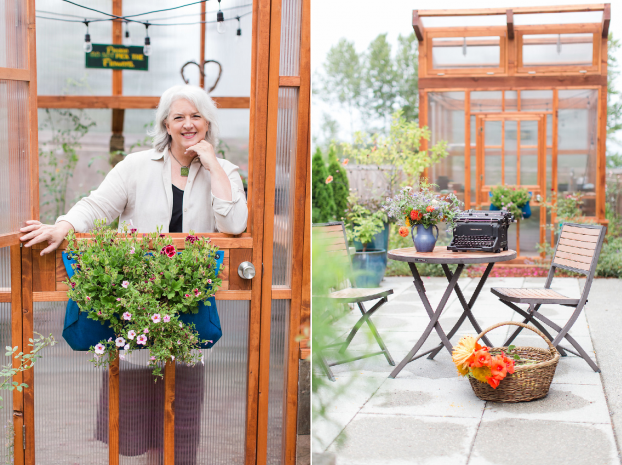 A number of years ago, with kids in college and beyond, Evelyn set her sights on the unlikely endeavor of creating a flower farm in the middle of the suburbs. 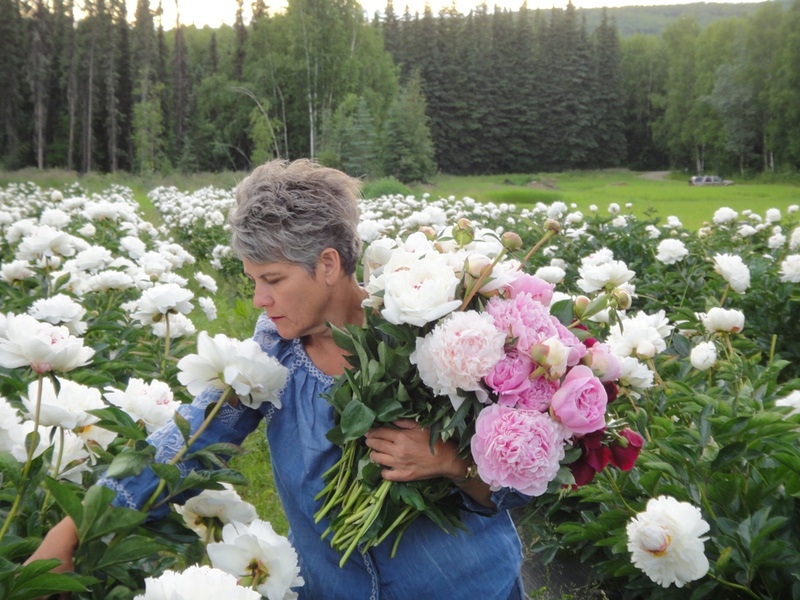 Call her crazy, but she believed, then and now, that people truly appreciate fresh flowers, and that people, our environment and our economy all benefit from locally grown blooms. 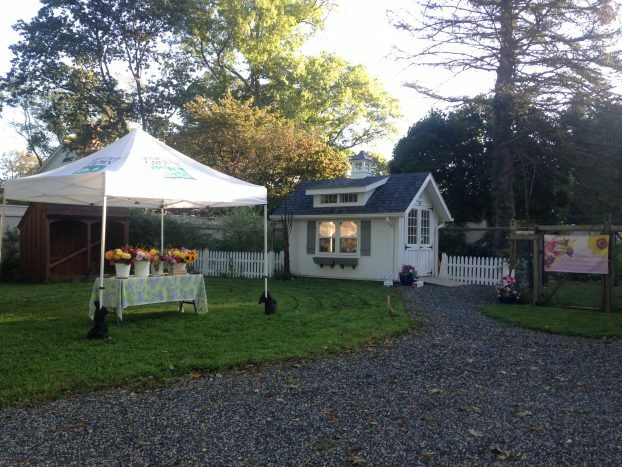 Butternut Gardens is a fabulous little flower farm, design studio and garden workshop tucked away in Southport, CT. 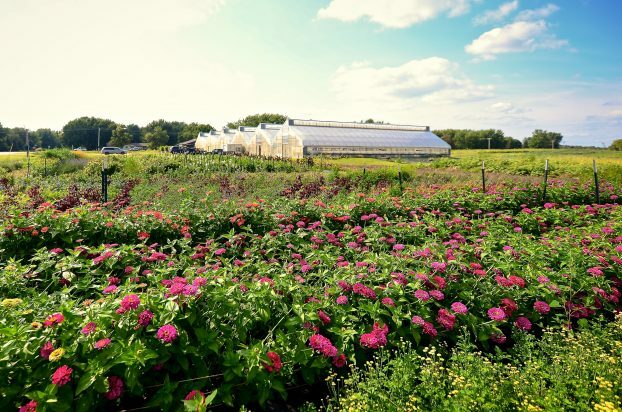 It is the only cut flower farm in Connecticut’s Fairfield County, offering the freshest of blossoms harvested daily at the peak of perfection. No shipping. No storage. Just rich, vibrant, delicious-smelling flowers every time. When you choose Butternut Gardens flowers, you also choose flowers grown in an earth friendly manner on a Bee Friendly Farm by Evelyn Lee, a NOFA Accredited Organic Land Care Professional. 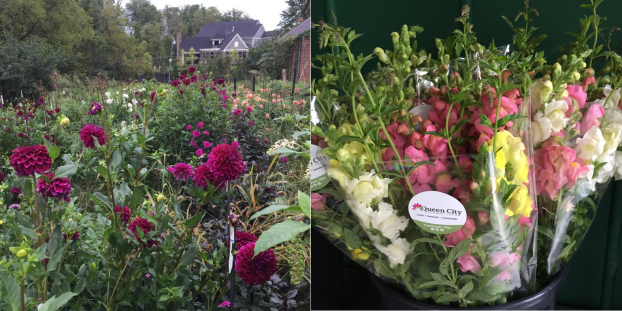 Not only is our goal to bring the true beauty, fragrance and astounding variety of freshly-cut flowers to your special events and into your daily lives, but also to share knowledge and best practices for sustainable suburban gardening, landscaping and land use. 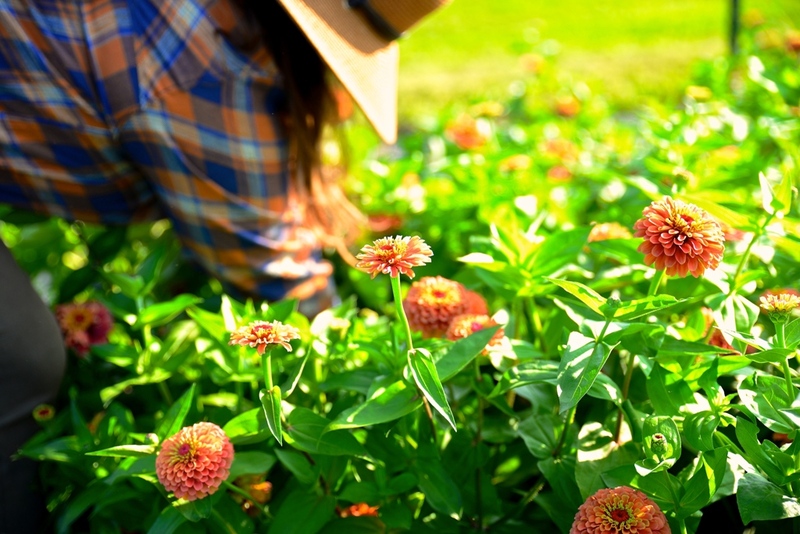 Butternut Gardens flowers do not receive synthetic fertilizers, and great care is taken to not only “do no harm” but to also protect and enhance soil, water and living organisms. 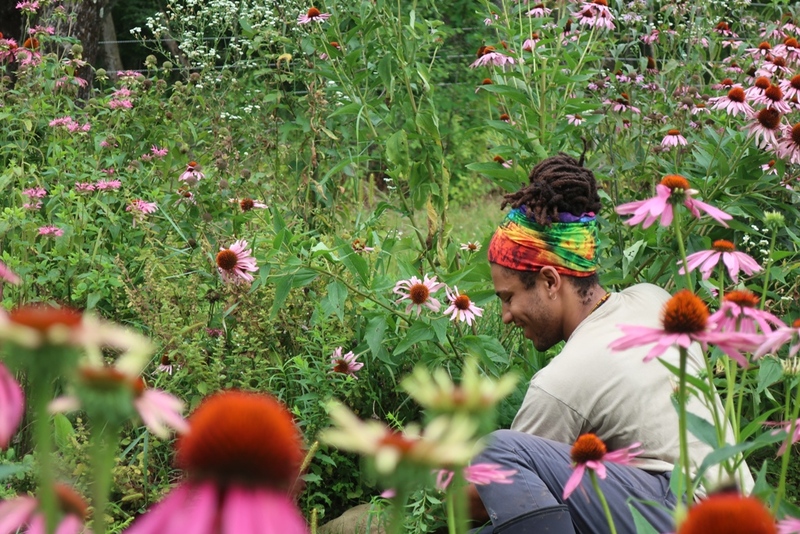 At Butternut Gardens, we leave plenty of flowers and pollinator-friendly habitat for neighborhood honey bees and an abundance of native pollinators, which call our land “home.” We strive to lead by example in our suburban neighborhood and hope to teach others about eco friendly gardening practices that can be applied to their land and gardens as well. A little education can go a long way! During the growing season (March to November) Butternut Gardens crafts an ever-changing parade of seasonal flowers, fruits, seeds, branches and other interesting natural botanical elements from the several hundred of varieties locally grown into seasonal bouquets and arrangements. 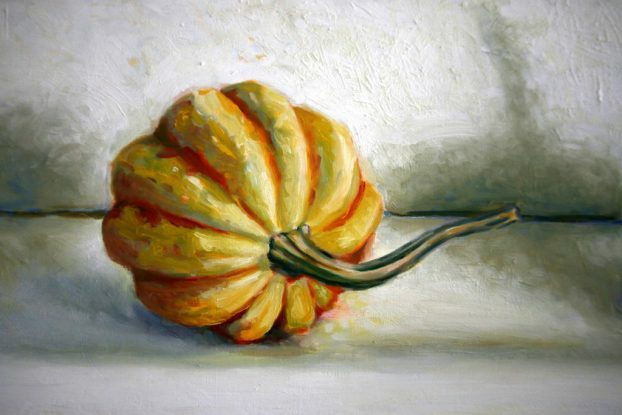 Thanks so much for joining my conversation with Evelyn Lee of Connecticut’s Butternut Gardens. I’m continually inspired by the momentum and energy that is taking place in key regions across the continent. 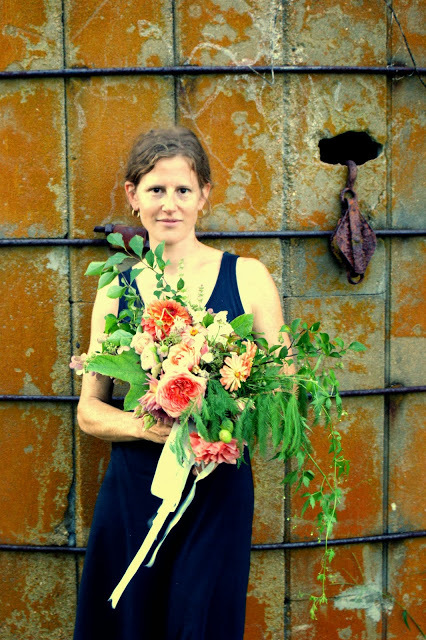 What’s happening with flower farmers and floral designers in Connecticut is also playing out elsewhere, spearheaded by creatives as passionate as Evelyn is. To be sure, we’ll continue hearing their stories here, on the Slow Flowers Podcast. The Association of Specialty Cut Flower Growers. Formed in 1988, ASCFG was created to educate, unite, and support commercial cut flower growers. It mission is to help growers produce high-quality floral material, and to foster and promote the local availability of that product. Learn more at ascfg.org. Coming right up, on March 23rd, is the Urban Farming Conference in St. Louis. More details can be found here. 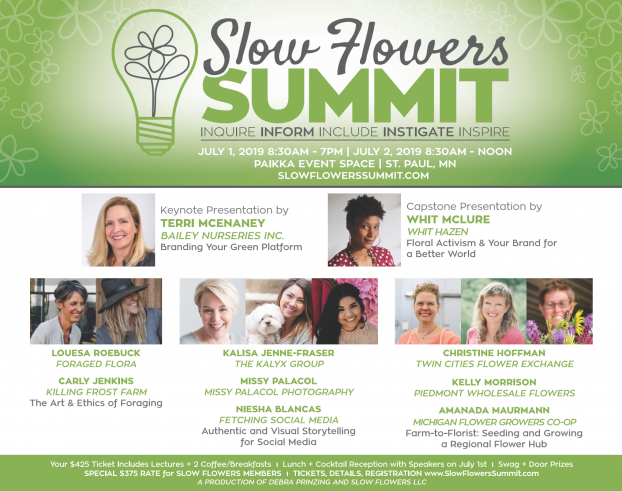 The Slow Flowers Summit is five months away on July 1 & 2nd in St. Paul, Minnesota. Make your way to slowflowerssummit.com to learn all about the many opportunities to join us — from flower farm tours and dinner on a flower farm to business and branding presentations to interactive and inspiring design sessions . . . all designed to serve you! Subscribe to Summit news and updates at slowflowerssummit.com. 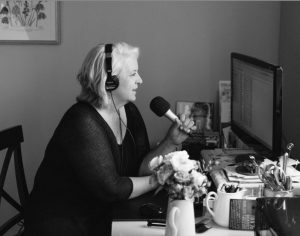 The Slow Flowers Podcast has been downloaded more than 414,000 times by listeners like you. Thank you for listening, commenting and sharing – it means so much. Thank you all! I’m delighted to share today’s conversation with Stacy Brenner of Broadturn Farm in Scarborough, Maine. Back in May 2012, after the publication of The 50 Mile Bouquet, I received an email from my dear childhood friend, Shari Shambaugh. We went to high school youth group together in Portland, Oregon, but she had since moved with her family to Portland Maine. 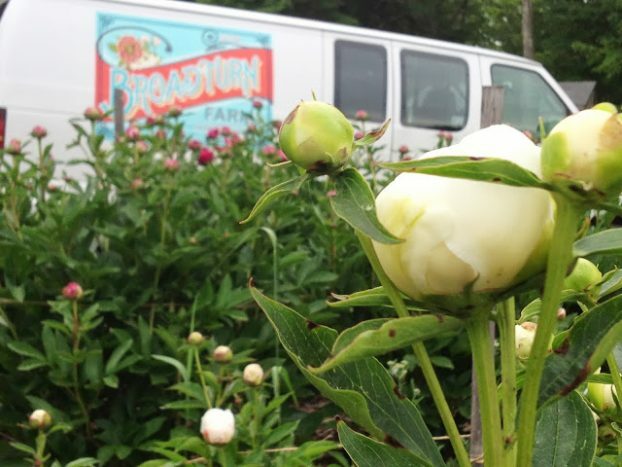 Our CSA farm starts up soon, so we’ll be having our source of wonderful produce back from Broadturn Farm. We tried a meat share with another farm this winter, both stepping back from the amount of meat we eat and choosing better/local sources. 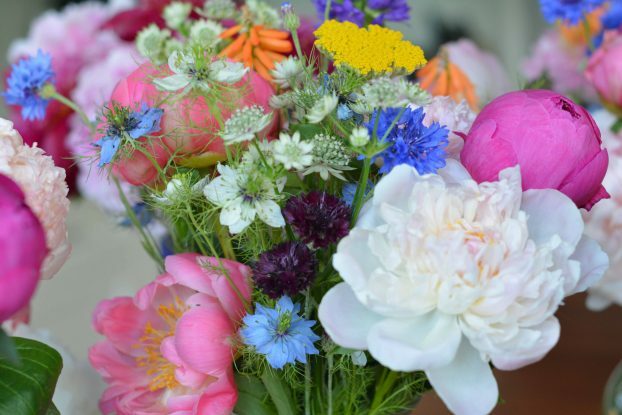 I am also thinking of getting the flower share this year, a weekly bouquet of flowers from our food CSA. You would love the blog site of our farmers (lovely people – we had dinner with them a few months ago at the home of mutual friends). Their daughter is a gifted photographer and Stacy (the mom) is a gifted arranger/grower. I knew they grew local blooms, but didn’t know there was a Slow Flower movement. Makes so much sense. I may go out and paint a few times this summer. I would be nice to get out into the open, and their farm has wonderful vistas. Just months later, I met Stacy Brenner and John Bliss of Broadturn Farm when they traveled to Tacoma for the ASCFG Conference — and we connected the dots that my friend Shari was one of their CSA customers. 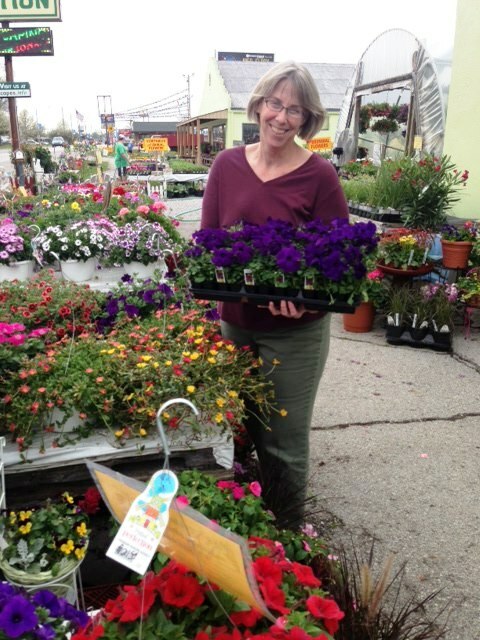 Love the small-world personal connections that happen when you talk about local and seasonal flowers! I don’t know why it has taken me so long to invite Stacy (and John, who was otherwise detained when we recorded today’s episode, reportedly working in their greenhouses) to be a guest on the Slow Flowers Podcast. So pleased we were able to record today’s episode via Skype this past week. There has been a lot of excitement coming out of Maine in the Slow Flowers world lately, including two back-to-back successful years with the Flowering in the North conferences, not to mention Slow Flowers’ relationship with our sponsor Johnny’s Selected Seeds, and our support of Rayne Grace Hoke’s Slow Flowers-inspired design workshops. John Bliss and Stacy Brenner share the work of running the farm and raising two daughters, Emma (22) and Flora (12). 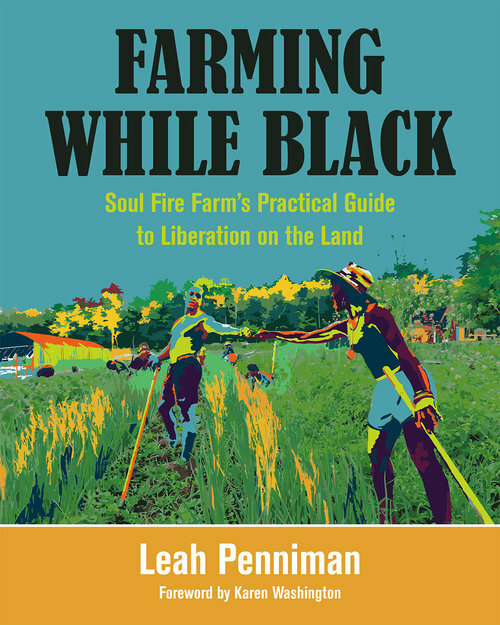 They both grew up in the suburbs of large cities, with no direct relationship to agriculture, but they started farming together in 2002. In their bio on Broadturn Farm’s web site, John & Stacy describe themselves as middle aged, at times cynical, hardworking and always delighted to have a good laugh with friends and co-workers. Good food is a high priority, as is travel and plenty of time to binge on TV in the winter during a snow-storm. 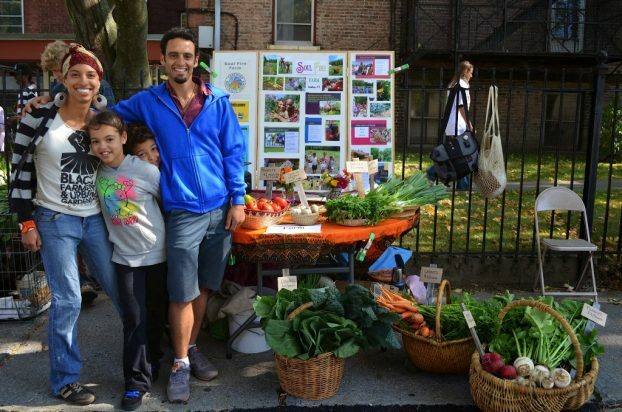 Access to real food, a strong need for connection to sustenance, and the potential to connect the verdant world with social justice is what urged this couple to put their hands to the earth. While the desire to raise food was easy to intellectualize, flower farming is a hobby gone wild. 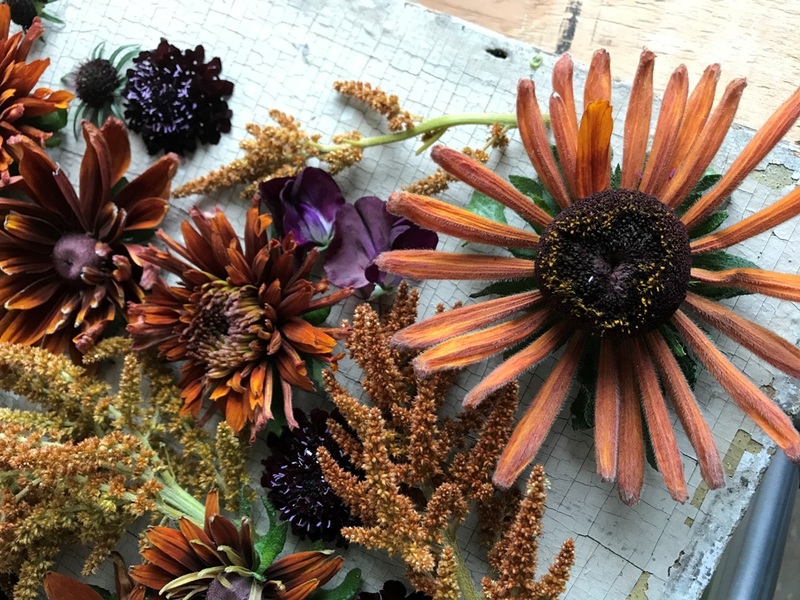 Stacy and John both have a love for making and growing, thus flower farming and flower design work is like an extension of the challenges of food production melded with the art of design. Every bucket of blooms still makes them giddy. The first bunch of tulips, the perfect peony and the dahlia with just the right shade brings such joy. And, much like the first meal their family enjoyed with all farm-produced food, the first big wedding they produced with all farm grown and foraged goods made their hearts sing. John and Stacy are truly honored to put food on people’s tables and flowers in their arms. They value Broadturn Farm as a gift, a real blessing, and they are open to sharing that with their community. There are trails to explore and fields to examine and there is always something going on with the livestock, from cud chewing to a mama hen trailed by her 6 chicks. And, if all that proves unexciting, the barn cats are sure to bring smile. If you come by, and you see John or Stacy puttering around, please say hello. They’re almost always busy in the season but never too busy to share a moment with a visitor. There are no regularly scheduled tours but don’t let that keep you from stopping by. I’m so pleased to share this conversation with you. Stacy has a lot of exciting news to share as well as insights that may inspire you to take a step back and reconsider your farm or studio’s mission and practices. 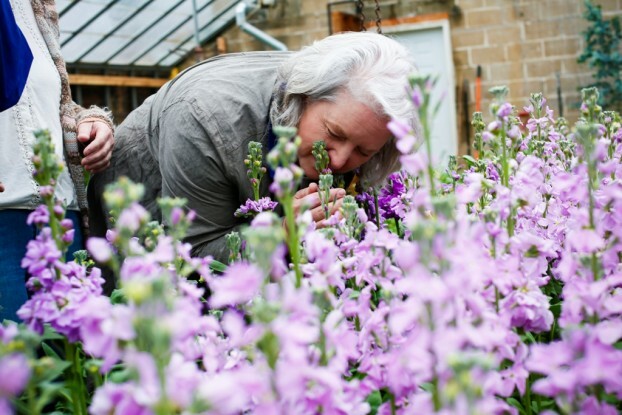 I’m delighted to share today’s conversation with Nan Matteson of Queen City Flower Farm in Cincinnati, Ohio. “Once vase at a time.” That was the line that hooked me. I could make one vase. I’m a podcast junkie and a gardener. Slow Flowers hit my radar either via Ken Druse or Riz Reyes early in the game. I listened all summer. I wanted to hang out with these people. I showed up at the ASCFG meeting in Delaware to explore more. Met you ever so briefly. Came home wondering, how can I be a part of this movement? I could read between the lines. People already owned the land. There was a husband/family in the background. But let’s be honest. I’m single, in my late 50’s, and wasn’t about to leave my good job w/ benefits. 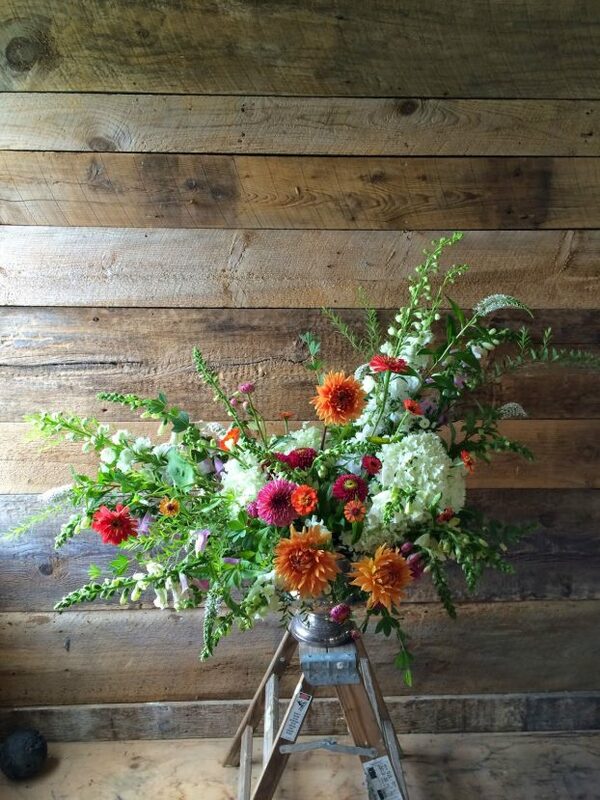 More beautiful bouquets and field-grown zinnias from Queen City Flower Farm. However, one afternoon in late November I had coffee w/ a local CSA farmer who had no interest in flowers. She said, “Nan, come grow for us on our land.” An offer I couldn’t refuse. So I have spent this summer providing mixed bouquets for Finn Meadows CSA. A barnacle business as Elizabeth Artis would say. A mini-micro biz I say. I average 7 bouquets a week. Not much, but seven more vases of fresh, local, seasonal flowers sitting on someone’s table each week. And I continue to listen to your podcast. Lucky for me I’m heading to NYC this week-end. And although not planned it turned out that I had scheduled myself the same week as the Field to Vase dinner in Brooklyn. Oh my gosh! So what’s another day in NYC if I can catch that event? I hope to see you there. Event bouquets (left) and a gift bouquet (right), grown by Nan Matteson of Queen City Flower Farm. Isn’t that just the kind of email to savor again and again?! 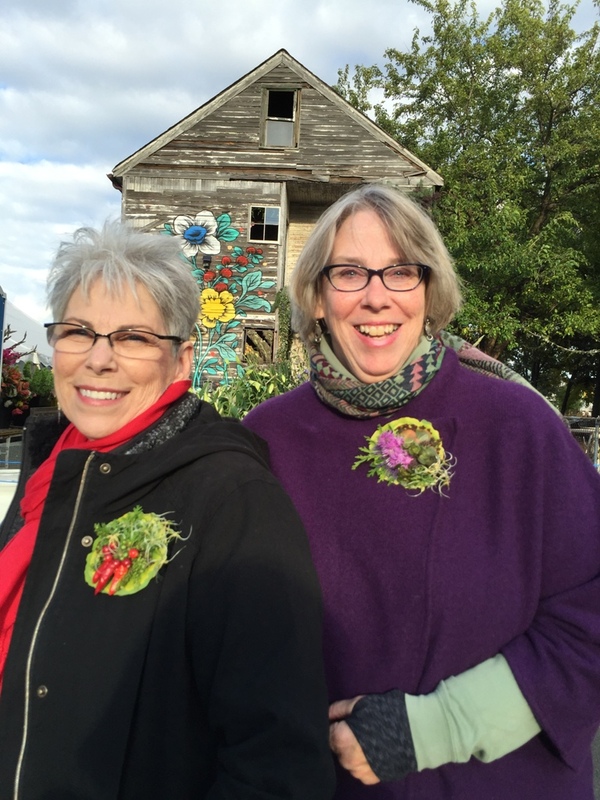 Nan (right) with her sister, at Flower House Detroit in 2015. The women are wearing botanical brooches, which Nan made. As it turns out, I met Nan that summer of 2015 in Brooklyn, and subsequently, at Lisa Waud’s Flower House Detroit, just a few months later. She joined Slow Flowers as a member, came to the Slow Flowers Summit #1 and #2 (and she’s already scheduled to join us in St. Paul at Slow Flowers Summit #3). We’ve met up at other flower events and when Nan came to Seattle last month for a short visit, I told her we needed to record an episode for the Podcast! Lucky for me, she said YES! I know you will enjoy our conversation and laughter. And you’ll be inspired as I am, by Nan’s joie de vivre and her determination to keep on growing flowers, even if just for a single vase of beauty. 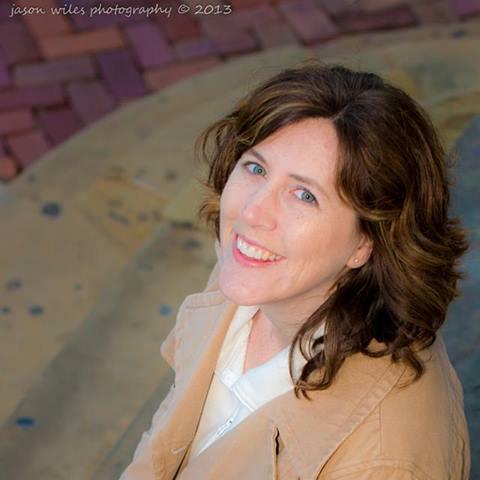 Find and follow Nan Matteson at these social places — she’s one you’ll want to follow and connect with. The Marmalade Lily, where Nan will be growing dahlias this coming season. 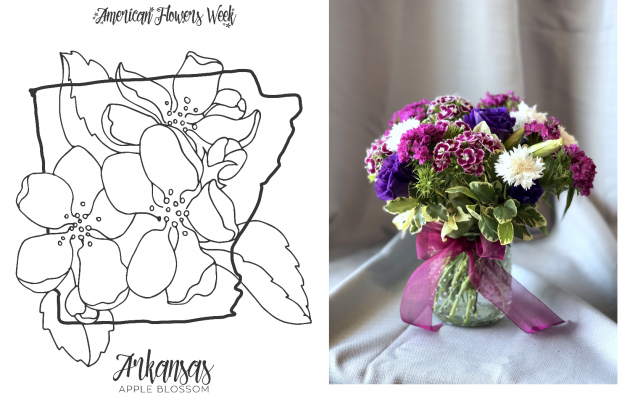 Our theme for 2019 – Fifty States of Slow Flowers – continues today, with Arkansas-based Althea Wiles of Rose of Sharon Floral Design Studio. Thanks so much for joining me on this journey, seeking new and inspiring voices, people with passion, heart, commitment and expertise to share with you. I hope today’s episode gave you at least one inspiring insight or tip to apply to your floral enterprise. What you gain will be multiplied as you pay it forward and help someone else. The Slow Flowers Summit is six months away so please save three dates on your calendar as you plan your travel to St. Paul, Minnesota. 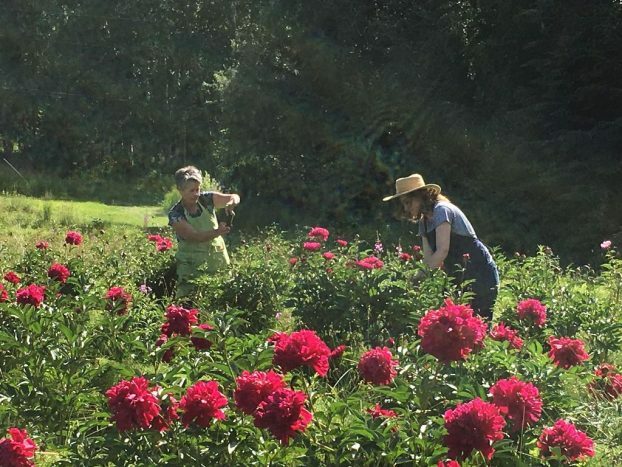 First, our bonus flower farm tours and Slow Flowers Dinner on the Farm, taking place on Sunday, June 30th. On Monday, July 1st, we will all gather at Paikka Event Space for day one of the Summit. On Tuesday, July 2nd we will tour the Twin Cities Flower Exchange as it’s swimming in locally grown flowers. I can’t wait to see you there! Ticket sales continue with a special Slow Flowers member discount at $375. 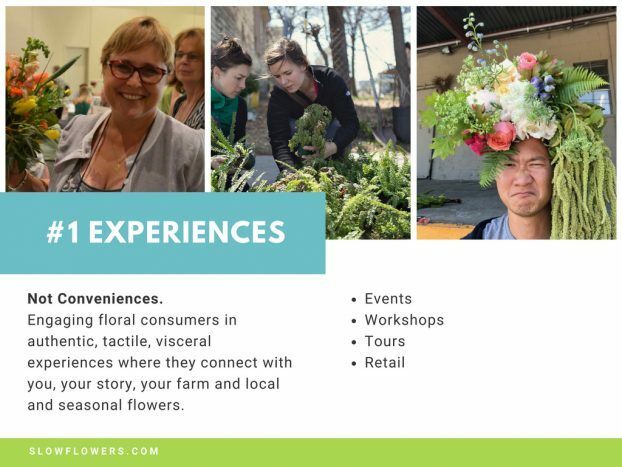 You’ll learn all about the many opportunities to join us — from flower farm tours and dinner on a flower farm to business and branding presentations to interactive and inspiring design sessions . . . all designed to serve you! Sign up to receive updates at slowflowerssummit.com. Thank you to our Sponsors, including those highlighted today! Florists’ Review magazine: I’m delighted to serve as Contributing Editor for Slow Flowers Journal, found in the pages of Florists’ Review. It’s the leading trade magazine in the floral industry and the only independent periodical for the retail, wholesale and supplier market. Take advantage of the special subscription offer for members of the Slow Flowers Community. Madras, Oregon-based NW Green Panels, designer and builder of a wide array of wood-framed greenhouses. Their greenhouses are 100% Oregon-made using twin-wall polycarbonate manufactured in Wisconsin, making NW Green Panel structures a great value for your backyard. The 8×8 foot Modern Slant greenhouse has become the essential hub of my cutting garden — check out photos of my greenhouse here! 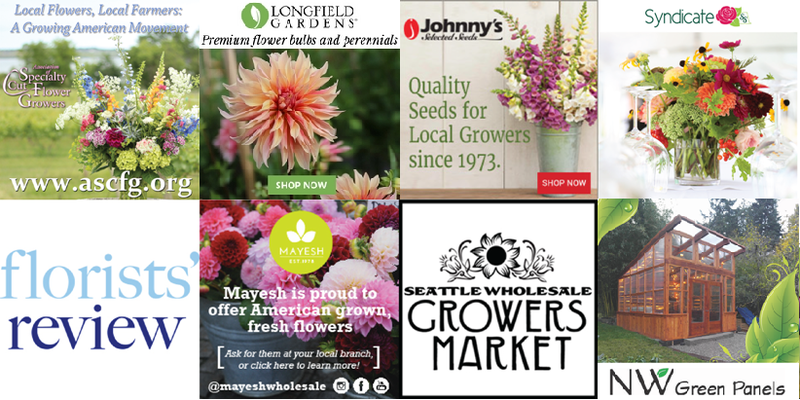 Seattle Wholesale Growers Market, a farmer-owned cooperative committed to providing the very best the Pacific Northwest has to offer in cut flowers, foliage and plants. 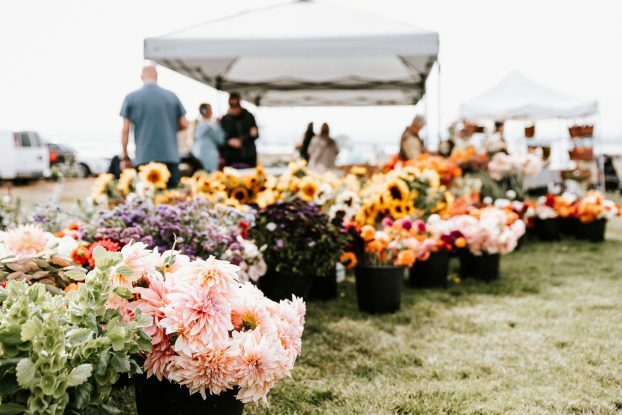 The Growers Market’s mission is to foster a vibrant marketplace that sustains local flower farms and provides top-quality products and service to the local floral industry. Visit them here. The Slow Flowers Podcast has been downloaded more than 405,000 times by listeners like you. Thank you for listening, commenting and sharing – it means so much. Thank you all! 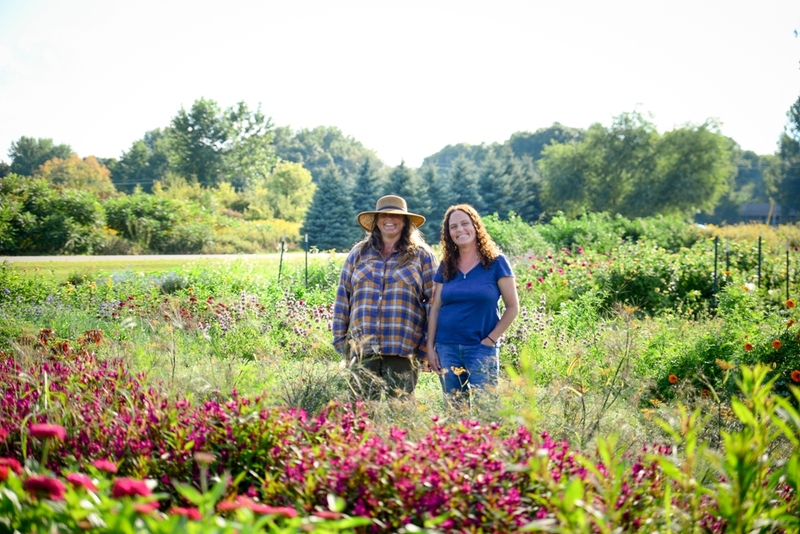 Please meet this week’s podcast guests, Jolea Gress and Jenny Hotz of Green Earth Growers. 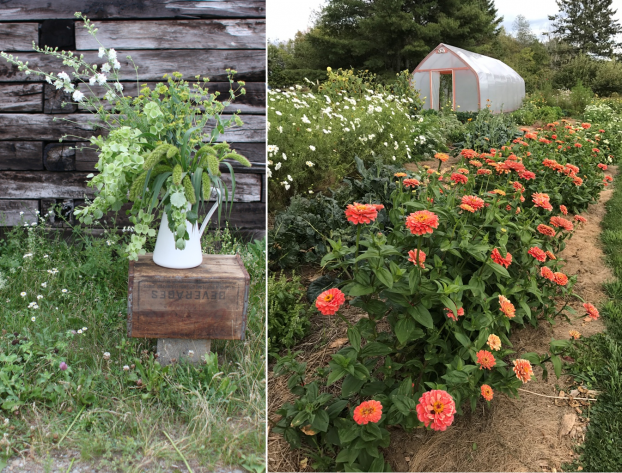 In today’s conversation, you’ll learn about their thriving business, their flowers, their wholesale and retail operations — plus, you’ll learn how you can join all three of us at the special Slow Flowers Dinner on the Farm, taking place June 30th prior to the third annual Slow Flowers Summit in St. Paul Minnesota. Our delicious and beautiful Flower Farm-to-Table meal will take place at Green Earth Growers, in Prior Lake, Minnesota. This established, women-owned plant nursery, vegetable and cut flower farm will wow you and I’m so pleased that Jolea and Jenny are sharing their story here today. Green Earth Growers is one of the Minnesota flower farms selling to the floral marketplace through the Twin Cities Flower Exchange wholesale hub. TCFE is our co-host of the 2019 Slow Flowers Summit. 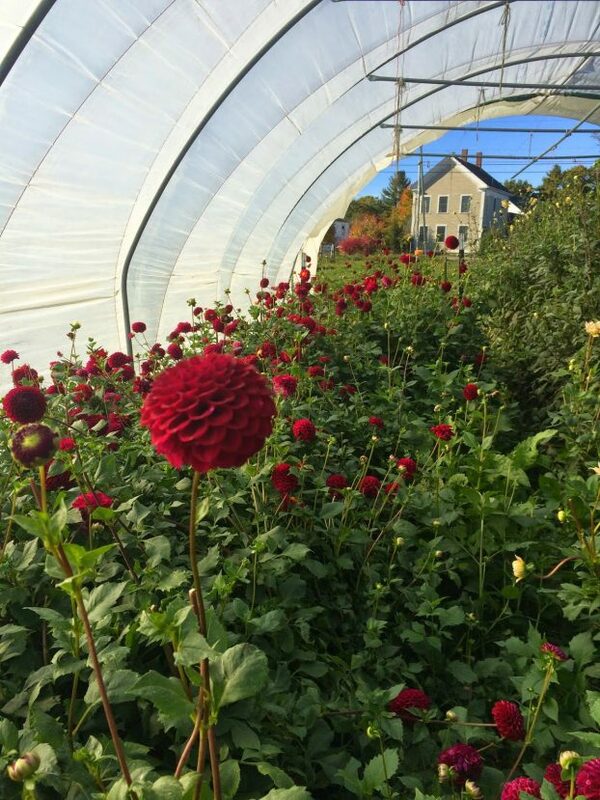 The flower harvest at Green Earth Growers. Green Earth Growers was established in 2004, located just south of the Twin Cities. Jenny and Jolea began by growing quality plants, produce & cut flowers for local farmers, fundraisers, garden centers, landscapers, farmers markets and restaurants. Slowly, throughout the years, they have expanded their greenhouse growing space and farmland. 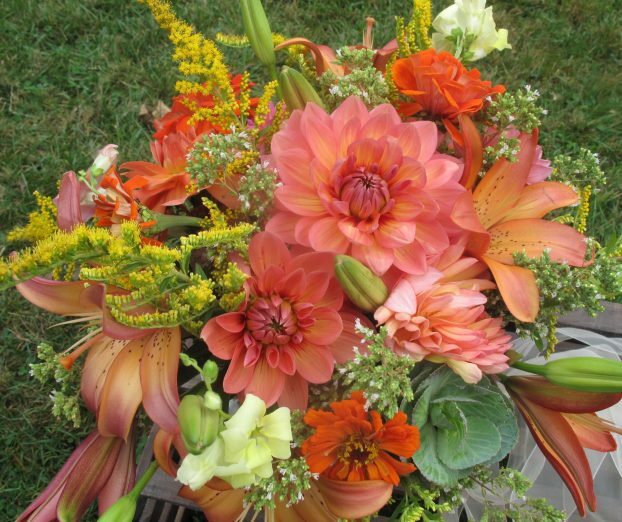 A vivid and freshly picked CSA bouquet from Green Earth Growers. The women continue to be committed to growing and producing quality products with an emphasis on sustainability. All their production (plants, produce and cut flowers) are grown in accordance with the National Organic Standards. Green Earth Growers is a Certified Naturally Grown business. Beautiful field-grown sunflowers from Green Earth Growers. CSA Bouquets (left) and bedding plants and hanging baskets inside the Green Earth Growers’ greenhouse. The retail center, Green Earth Gardens, opened in 2013, operating seasonally, late April to July. The center offers sustainable grown plants that are Minnesota hardy and an alternative to the plants you find at big box stores. Always experimenting with new plant varieties and growing methods, you can tell that Jenny and Jolea are passionate about flowers plants. Their passion is contagious and I can’t wait to visit them in June! 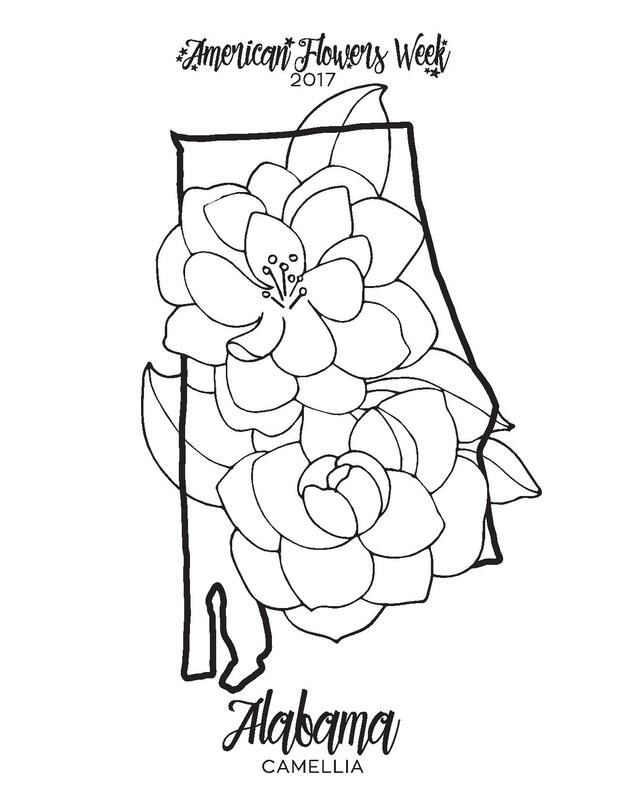 I love our Alabama state flower coloring page with a Camellia, designed by Jenny Diaz for American Flowers Week! I want to share about our special theme of 2019 – Fifty States of Slow Flowers – which begins today, and continues through the end of 2019, for fifty consecutive weeks, I will devote a bonus mini-interview at the end of each episode to speak with a member about what’s happening in his or her state. Averaging 10 minutes or so, we’ll give you a snapshot of floristry, flower sourcing and the unique character of the Slow Flowers scene — from Alabama to Wyoming and everywhere between. We’ll also make some important stops along the way to speak with members in the Canadian Provinces — yay! Today’s state spotlight begins with Alabama’s Lisa Thorne of Thorne & Thistle. 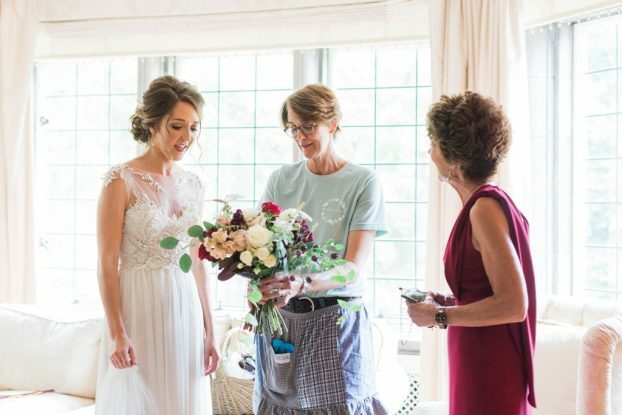 Thorne and Thistle is a destination wedding and floral design studio with a passion for travel and creating meaningful, memorable moments for our couples across the southeastern states and beyond. 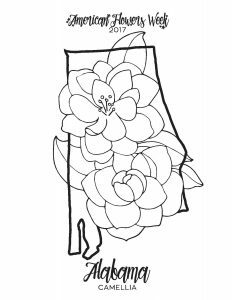 You can read more about Lisa in a feature I wrote for the November 2017 issue of Florists’ Review, called “A Southern Sense of Style.” Click here to read. 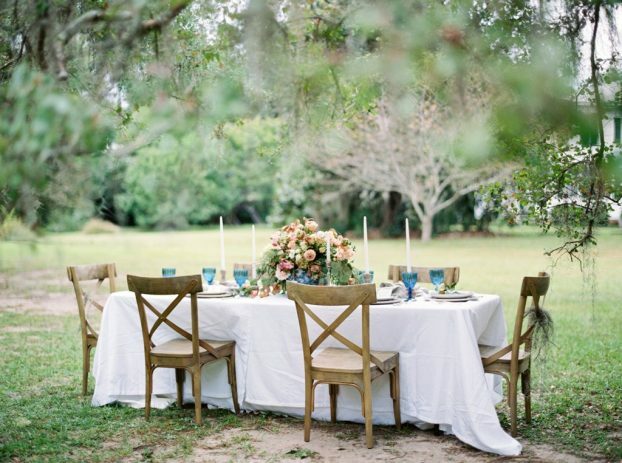 A beautiful Alabama tablescape, designed by Lisa Thorne of Thorne & Thistle. The Slow Flowers Podcast has been downloaded more than 397,000 times by listeners like you. Thank you for listening, commenting and sharing – it means so much. Thank you all! Today’s first thank you goes out Syndicate Sales, an American manufacturer of vases and accessories for the professional florist. Look for the American Flag Icon to find Syndicate’s USA-made products and join the Syndicate Stars loyalty program at syndicatesales.com. 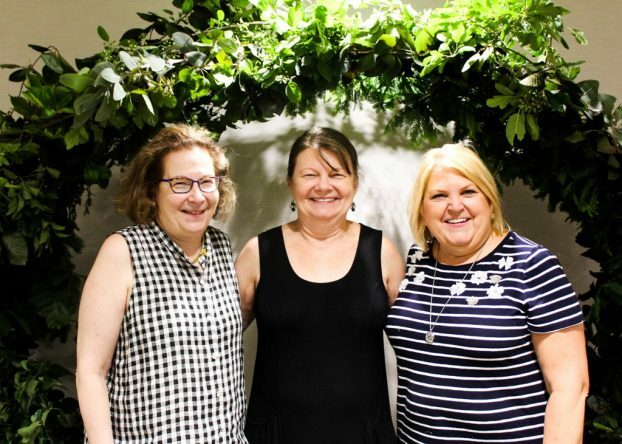 Team Flower Conference – a professional floral event where flower lovers from all over the world gather for networking, learning, and celebration. 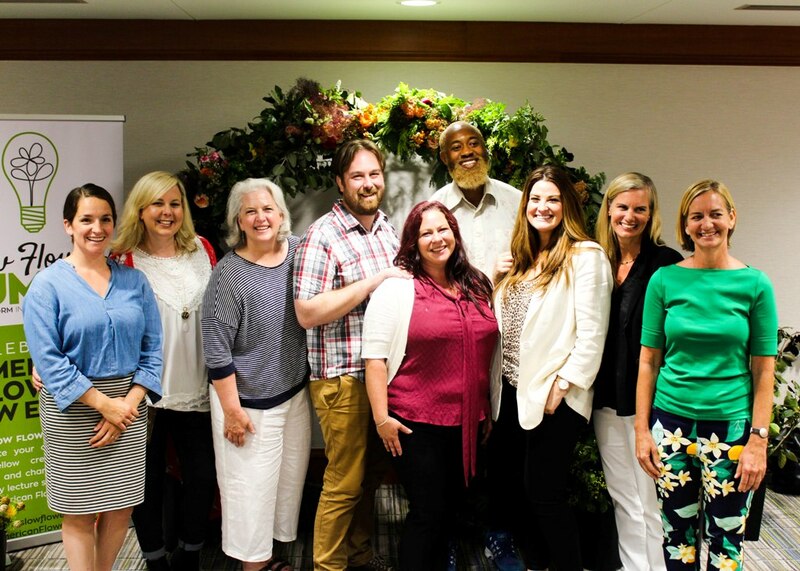 It’s a special time for the floral industry to come together and whether you’re a farmer, designer, wholesaler, or just love flowers, you’re invited to attend as Team Flowers dreams big for the industry’s future. Head to teamflower.org/slowflowers to learn more about the 2019 conference in Waco, Texas! Association of Specialty Cut Flower Growers. Formed in 1988, ASCFG was created to educate, unite, and support commercial cut flower growers. It mission is to help growers produce high-quality floral material, and to foster and promote the local availability of that product. Learn more at ascfg.org. And check out the web site for details about the upcoming Focus on the Business of Cut Flowers conference, set for Feb 18-19 in Denver. Seven of the experts presenting at the conference are past guests of the Slow Flowers Podcast, so you’ll recognize some familiar names and topics in the lineup! Johnny’s Seeds flower trial gardens in Maine. If you’re a regular listener to the Slow Flowers Podcast, you know that Johnny’s Selected Seeds is one of our most supportive sponsors and partners. 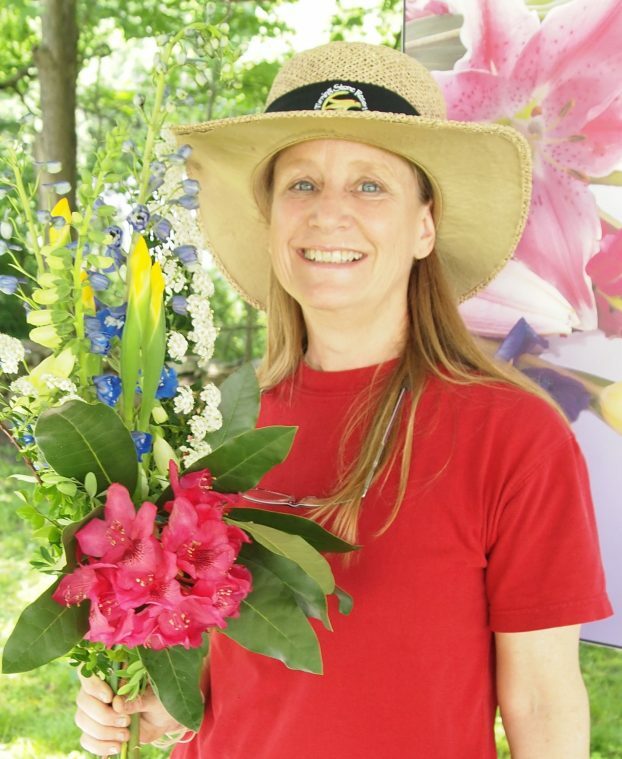 I have been pestering today’s guest, Hillary Alger, Johnny’s Flowers Product Manager, to let me record an interview with her for quite a while. We finally took time over the holiday break to jump on Skype and do it. I’m so pleased because the timing for discussing flower seeds and growing flowers is perfect. Winter is when we all think about next season’s crops and new varieties to trial. Whether you have a backyard cutting garden like me or a legitimate flower farm, you probably have visions of beautiful blooms dancing in your head. And each image we see, whether it’s in a catalog or online, is enough to send our hearts racing as we add just one more variety to the wish list. Hillary is here today to discuss that process – how does an established seed company like Johnny’s, which was founded in 1973, select, trial, evaluate and bring to market thousands of varieties of vegetable, herb and flower seeds each year? 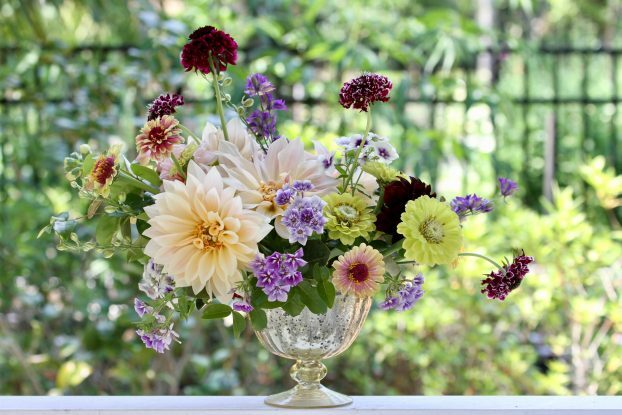 Even if you’re just a bit of a flower geek, this conversation will engage and inspire you. 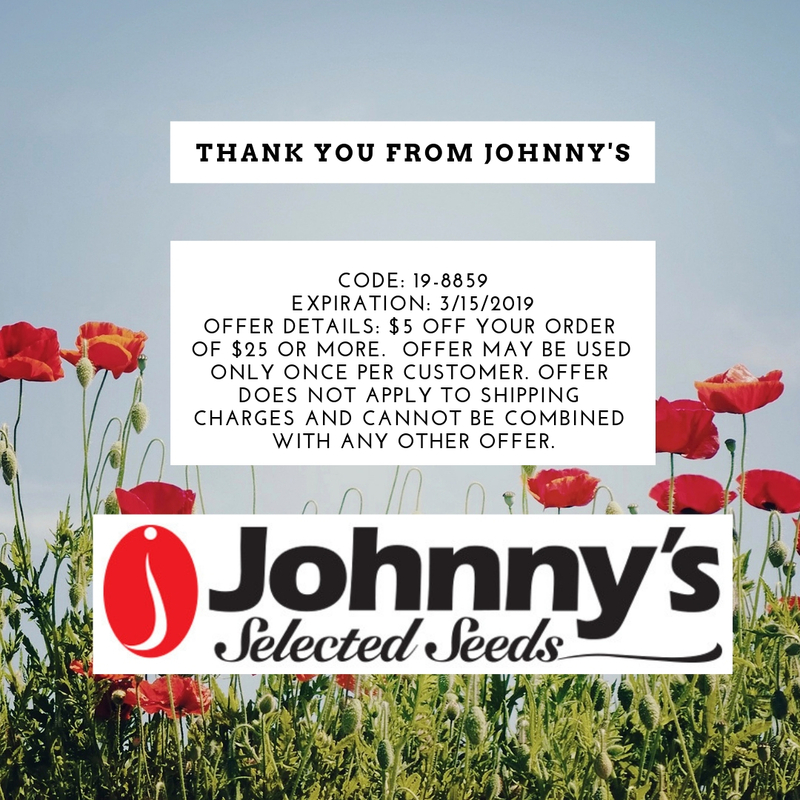 Hillary also discusses some of the more than 25 new annual seed varieties coming online in Johnny’s 2019 catalog, as well as the decision to reintroduce bulbs for cut flower growers. 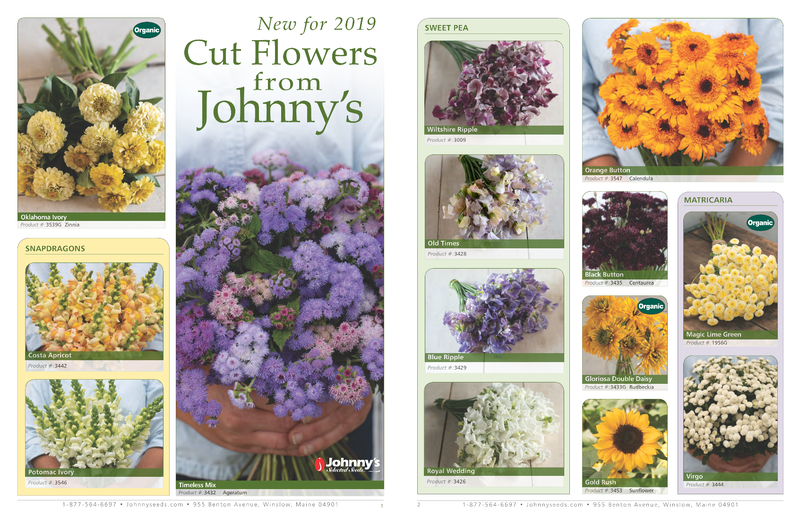 After more than a decade hiatus, the pages of Johnny’s catalog include more than 35 narcissus and tulip varieties. Click here to download a 4-pg PDF of all new new 2019 flowers. Hillary often styles photo shoots for online and print, including fun floral flat-lays. With a fine arts background, Hillary has fused her love of painting with her career in vegetable and flower seed promotion. Here is one of her paintings of an heirloom squash. The Slow Flowers-Johnny’s Seeds partnership is a mutually rewarding one — and I’m so grateful to bring this episode to you today. 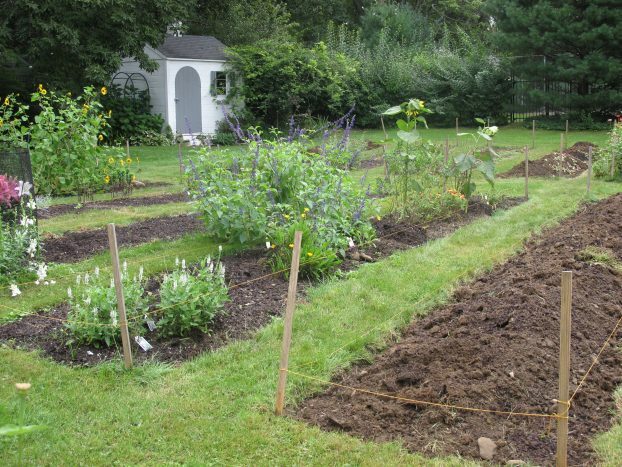 Click here to read a recent post about Growing a Cutting Garden, with more resources from Johnny’s. Here’s a bonus gift for listeners of this podcast — Thanks, Johnny’s! First of all, we’ve been running an Early Bird ticket promotion for the Slow Flowers Summit 2019 and that opportunity has closed. Nearly 50 of you took advantage of the early bird pricing — and we will sell out the conference at 150 registrations. 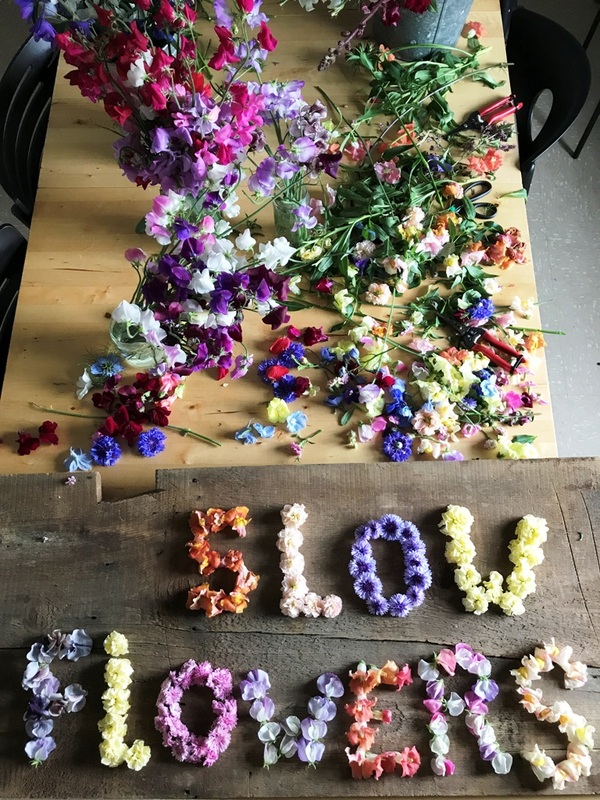 So don’t have FOMO — you’ll want to make your way to slowflowerssummit.com to learn all about the many opportunities to join us — from flower farm tours and dinner on a flower farm to business and branding presentations to interactive and inspiring design sessions . . . all designed to serve you! 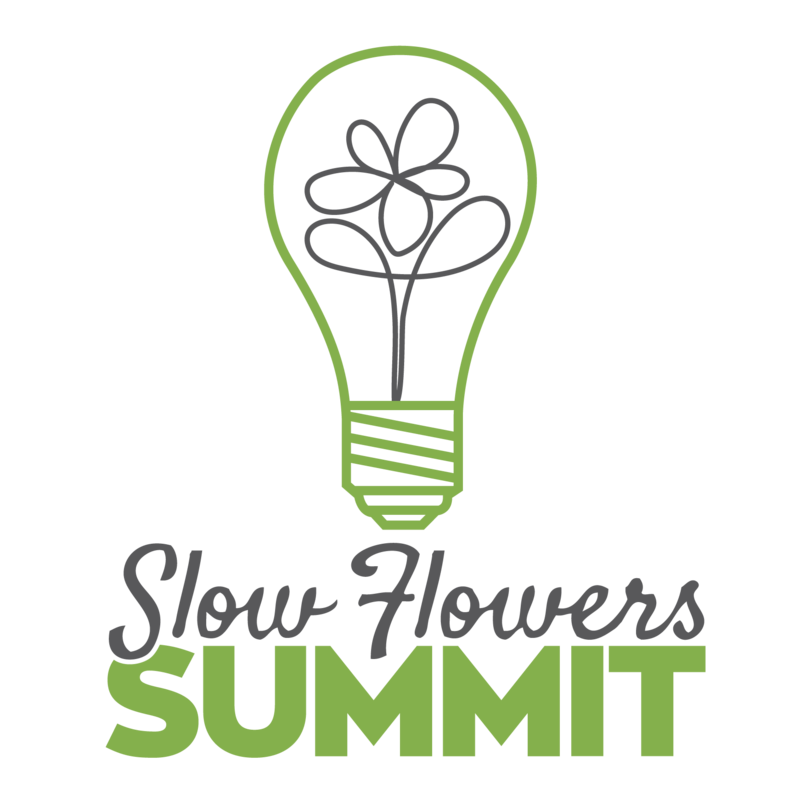 Slow Flowers members will still enjoy discount pricing up until the day of the Summit. Sign up to receive updates at slowflowerssummit.com. 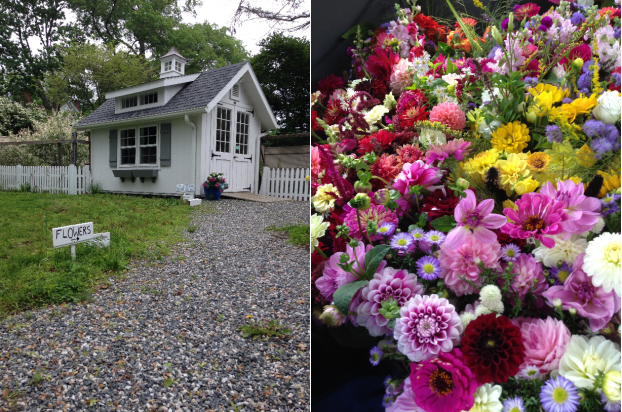 Left: A spring bouquet designed by Hillary for a Johnny’s Seeds photo shoot; right: Hillary’s home cutting garden. The Slow Flowers Podcast has been downloaded more than 395,000 times by listeners like you. Thank you for listening, commenting and sharing – it means so much. Thank you all! NW Green Panels. Based in Madras, Oregon, NW Green Panels designs and constructs a wide array of wood-framed greenhouses offering versatility, style and durabilty. They are 100% Oregon-made using twin-wall polycarbonate manufactured in Wisconsin, making NW Green Panel structures a great value for your backyard. The 8×8 foot Modern Slant greenhouse has become the essential hub of my cutting garden — check out the link in today’s show notes to see photos or visit nwgreenpanels.com. Welcome to the 2019 Forecast! I’ve finally put away the holiday decorations and with my thoughts already turning to the spring garden, it’s time to look to the future. 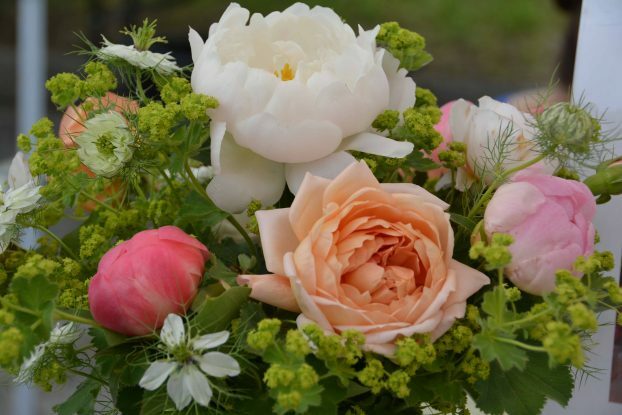 Our BIG NEWS for 2019 is the launch of a one-stop web site for all-things Slow Flowers. 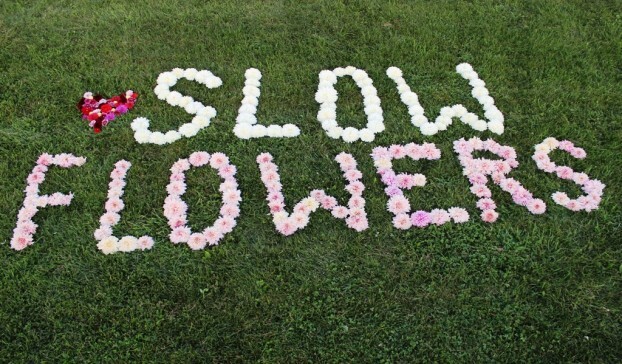 Please visit our newly-branded site on the web — SlowFlowersSociety.com. Check out the NEW Slowflowerssociety.com site! It is fresh, user-friendly and gives you access to all of the Slow Flowers programs, events and channels in one place. Why the Society? Our focus hasn’t changed. In fact our mission continues. Which is: to change the flower sourcing practices of consumers and professionals through outreach and education that highlights the benefits of local, seasonal and domestic floriculture — and to build a movement that promotes cultivation and sales of those flowers while nurturing authentic connections between consumers, farmers, and florists. Slowflowers.com is now part of the Slow Flowers Society underscores our inclusive community dedicated to preserving domestic floral farms and supporting safe, seasonal and local supplies of sustainablyfarmed flowers and foliage. Our members are engaged in all facets of the U.S. floral industry. I’m excited to share highlights from the annual Slow Flowers’ Floral Insights and Industry Forecast. This report originated in the fall of 2014, when I traveled to NYC to meet with garden and lifestyle media as part of the launch of Slowflowers.com. The publicists helping me, Lola Honeybone and Marla Kramer, suggested I produce a powerpoint presentation to help illustrate the central themes of the Slow Flowers movement. 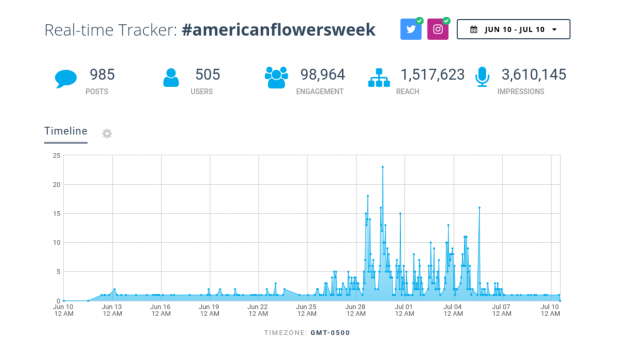 It was a great tool to walk editors and writers through our platform, and to discuss shifts taking place in the floral marketplace that directly reflected significant changes in how flowers could be grown, designed and marketed. When 2015 rolled around just months later, I shared those insights on this Podcast — and it became the first of our annual ritual. For each of the past five years, I have drawn from a number of sources to develop this annual forecast. Sources include hundreds of my first-person interviews for print and digital stories, input gathered from the Slow Flowers Community, conversations with past guests of the Slow Flowers Podcast and idea-exchanges with other progressive leaders in the floral marketplace — farmers, florists and design creatives — who together inspire this “floral futures” report. I hope you find these forward-thinking resources important and valuable. I’d love to hear your feedback and suggestions. Find an expanded version of this report, including a free PDF [Download here: Slow Flowers Forecast 2019]. You can also find an executive summary of the report in the pages of the brand new January 2019 edition of Florists’ Review. A note about our programming change for 2019. Because of so much demand — all good — from podcast sponsors, we are trying something a little different for 2018. Rather than giving you a lengthy sponsor list at the end of the show, I’ll highlight just three sponsors during the episode — at the beginning, our mid-show break – and at the end. 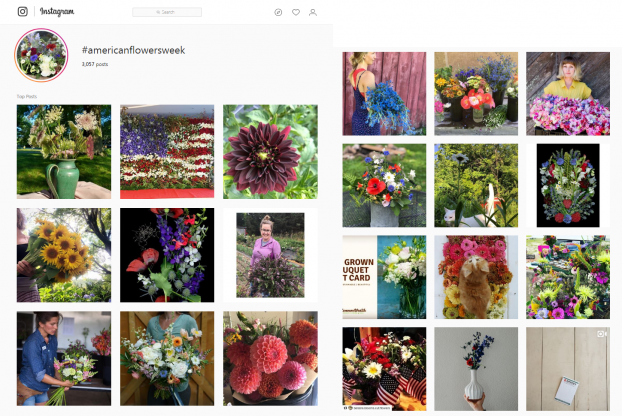 First up: the Association of Specialty Cut Flower Growers. 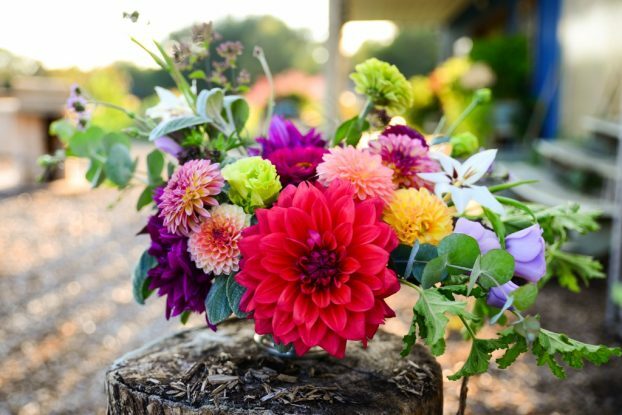 Formed in 1988, ASCFG was created to educate, unite, and support commercial cut flower growers. Its mission is to help growers produce high-quality floral material, and to foster and promote the local availability of that product. Learn more at ascfg.org. And check out the web site for details about the upcoming Focus on the Business of Cut Flowers Conference, set for Feb 18-19 in Denver. Seven of the experts presenting at the conference are past guests of the Slow Flowers Podcast, so you’ll recognize some familiar names and topics in the lineup! I know you’ll agree with me that the floral professional’s role is to connect consumers with the natural world through artistry and design. So it’s no surprise that this year’s emerging themes include ideas and concepts that strengthen community ties with values-driven consumers, as well as nurture entrepreneurial innovation in horticulture and floriculture. If you’re an “early adopter,” these concepts may resonate or reinforce your current approach to sustainable design. In recent months, I’ve shared many of these ideas at top industry venues, including Hitomi Gilliam’s Trend Summit 2018, the Association of Specialty Cut Flower Growers‘ annual conference and the Southern Flower Symposium. I’ll also share this report at an upcoming member-only event for the Seattle Wholesale Growers Market on Jan 23rd. Find more details here. In a retail climate where Amazon is king, those who engage floral consumers in authentic, tactile, visceral experiences will break through the click-and-buy or cash-and-carry mindset. 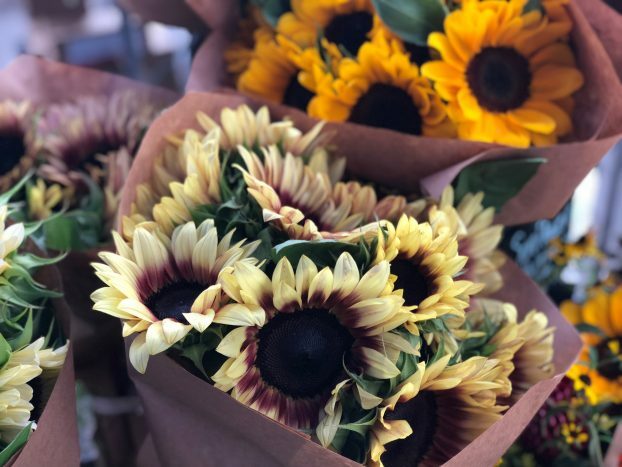 Customers who connect with you, your story, your flowers and the origin of those flowers are the foundation of your loyal tribe. And while efforts and actions that strengthen our ties with customers isn’t an entirely new concept, it is one you must habitually practice, especially in today’s cluttered and distracting marketplace. Events, tours, workshops and other experiential programming are critical — and much more powerful than touching customers through social media channels alone. Many of you have a deep understanding of the power of experiences, and my advice to you is to continue investing time, resources and creativity to offer the floral marketplace a chance to forge a relationship with you and your flowers. We place so much thought, time and care into planning the best experience we possibly can and we hope that shows! This is a space and a time where memories are made and we hope each and every person felt a warm welcome. We felt so much love yet again by all who attended, including amazing local vendor family. Each vendor and their products speak to hard work, quality and friendship, we are so honored to have so many great people surrounding us at our farm! You don’t have to be a professional event planner to pull off an experience-rich program. Not at all. Start small and open your studio or farm gate to flower lovers — you’ll be positively rewarded. 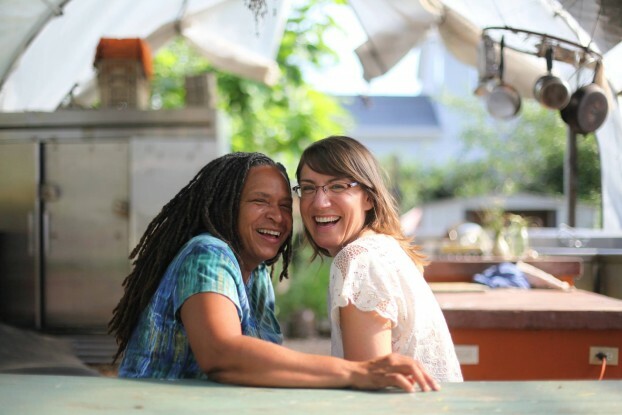 The Slow Flowers Community and listenership of this program have grown larger than ever, with more than 390,000 total downloads since this show launched in July 2013. That’s amazing news and I’m thrilled to share it with you. Every single week this year; in fact, every single week for the past 282 weeks, it has been my privilege to feature the voices of our Slow Flowers community with you. 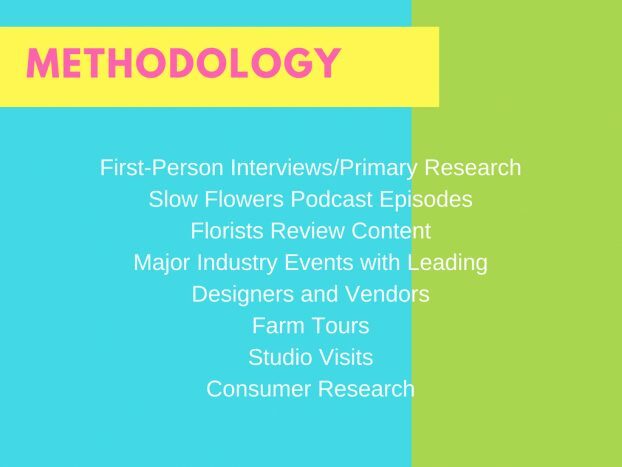 Unlike any other internet radio show in existence, the Slow Flowers Podcast is tailored to you and your interests, making its “must-listen” programming a habit among flower farmers and floral designers alike. In producing and hosting the Slow Flowers Podcast, I seek out pioneers and personalities, style-makers and influencers — as well as unsung or little known heroes — who together are changing the floral landscape, disrupting the status quo, and bringing flower sourcing and growing practices, not to mention eco-conscious design methods, to the center of the conversation. And thanks for joining in. Whether you’ve just discovered this podcast or are a longtime fan, I encourage you to take advantage of the immense body of knowledge that can be found in the archives. 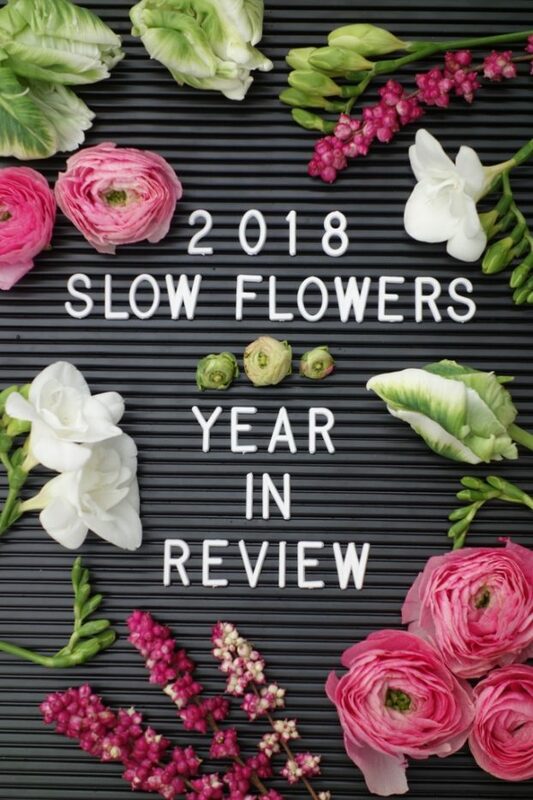 As I have done since the beginning of 2014, I would like to devote today to the Slow Flowers Highlights of this past year. 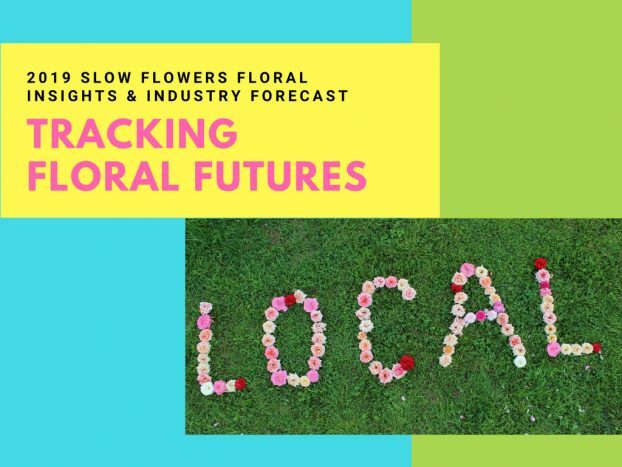 Next week, on January 2nd, I will present the annual Slow Flowers’ Floral Insights and Industry Forecast for 2019. I’m motivated as a storyteller to connect with the Slow Flowers Community in real and personal ways — and that was certainly the case in 2018. Rather than share a chronological travelogue of the year’s calendar, I’m mixing it up today. I’ve looked in the rear-view mirror to remember 2018 and — wow — the themes bubbling up to the top are impressive. I’m humbled by the warm embrace of the Slow Flowers Community and more than ever, I realize that making authentic human connections with you is what really matters. Each experience is more meaningful because of the relationships we forge with one another. I’ve identified 10 Top Themes of 2018 that I want to reflect on and share with you today. 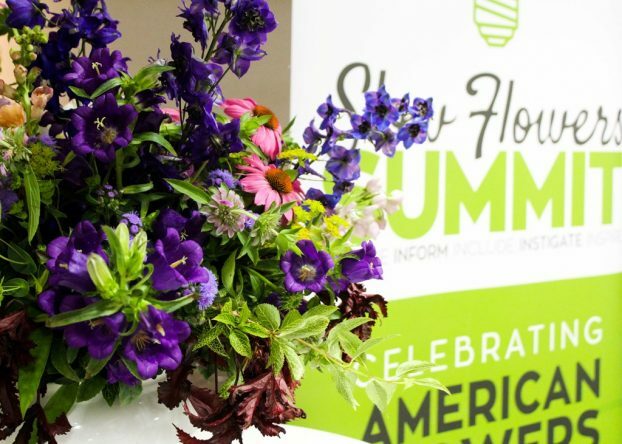 The Slow Flowers Summit is the LIVE event in the midst of American Flowers Week, created to serve the Slow Flowers community of progressive, sustainably-minded florists and designers and to engage attendees who want to network with one another. Planning and producing the 2nd Summit was a huge financial risk, especially since it was the first time on the east coast, away from our original Seattle venue. I knew we could lose money but my heart told me it was important to forge ahead, as I found myself inspired by the amazing sense of inclusion, connection, new ideas, beauty and humanity surrounding our floral-filled lives. I believed taking that risk was essential. That risk paid off and we actually had a sold-out Summit on Friday, June 29th in Washington, D.C., with a remarkably welcoming venue host – the American Institute of Floral Designers. I have so many people to thank for helping produce the Summit, so let me get started. First of all, thanks to Bob Wollam and his team at Wollam Gardens for opening up their Virginia farm the day prior to the Summit for tours, lunch and community. That bonus pre-event was so positive that it inspired us to add two pre-event flower farm tours for our 2019 Slow Flowers Summit. THANK YOU all! Ellen Seagraves, Cathy Houston and Dana Sullivan ~ the talented florists who led our interactive floral installation. We had wonderful day-of volunteers, but I mostly want to single out Ellen Seagraves of Chic Florals and Dana O’Sullivan of Della Blooms, both Slow Flowers Members and part of Independent Floral Designers of Maryland, for volunteering to create the Summit’s interactive floral installation. We had so many wonderful donations from flower farms to pull this off — including Charles Little & Co., FernTrust, Green Valley Floral, LynnVale Studio & Farm and Resendiz Brothers Protea Growers — as well as EcoFresh Bouquets, which provided wraps for the foam-free installation. I can’t forget to thank our speakers — without whom the day would have been an empty room, of course. Our keynote speaker Christina Stembel of Farmgirl Flowers wowed us with a frank discussion of building a self-funded floral business through grit and determination. We enjoyed two visually and intellectually-inspiring design + business presentations geared toward florists who are committed to the Slow Flowers ethos, in their sourcing and in the ways they build community — Thank you Kelly Shore of Petals by the Shore and Mary Kate Kinnane of The Local Bouquet and thank you Kit Wertz and Casey Schwartz of Flower Duet. Our Flowers + Tech panel introduced a fascinating discussion about the challenges of transportation, infrastructure and shipping — thank you to Jonathan Weber of greenSinner, Jessica Hall of Harmony Harvest Farm and Christina Stembel of Farmgirl Flowers for their excellent presentations and for helping us look toward the horizon of new business models. And finally, thank you to our final two speakers, men who are passionate about flower farming as a tool for improving the lives of their communities ~ Walker Marsh of Tha Flower Factory in Baltimore and Mud Baron of Flowers on your Head in Los Angeles. Flowers on my head, courtesy of Mud Baron. Among other messages, we learned from them about sowing future seeds of hope through flowers. 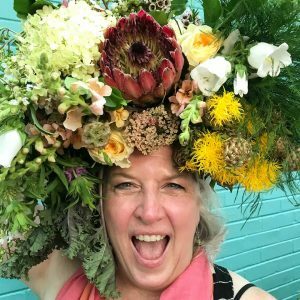 If you were in attendance – or if you followed the fun on social media, you also know that Mud was a flower force to be reckoned with as he festooned our heads with bouquets to fulfill his mission of photographing as many humans as possible for his Flowers on Your Head photographic project. If you missed the Summit, you can find all the video presentations available to watch for just $48 on Vimeo — a full day of ideas, information, inspiration, inclusion and instigation with each of these speakers. Watch a free clip of my opening remarks about the origins of the Slow Flowers Summit. 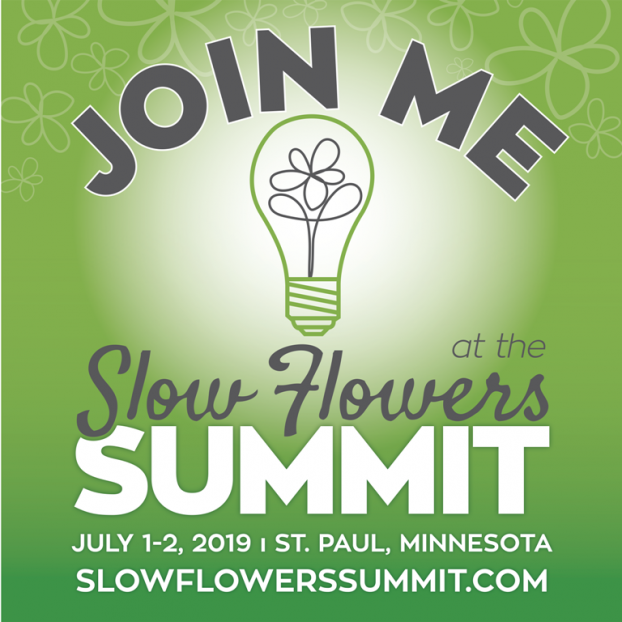 And I can’t finish this section without reminding you to register for the 3rd annual Slow Flowers Summit, taking place July 1-2, 2019 as an expanded conference, offering you more value and benefits for attending. The early-bird pricing continues through Dec. 31st so there’s not much time left to save $100 and grab a seat to join me and some wonderful speakers in St. Paul Minnesota! This original flower promotion holiday, launched in 2015, celebrated its fourth annual campaign. 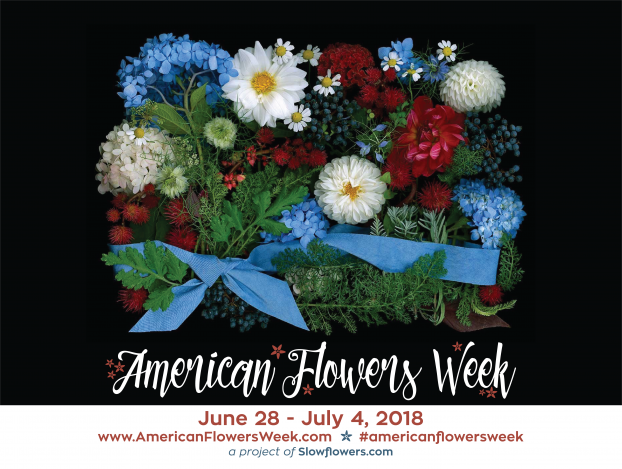 I was encouraged and inspired by friends behind British Flowers Week to create American Flowers Week (and to continue their generosity, I helped support the creation of Canadian Flowers Week this past September). This grassroots, all-inclusive campaign provides editorial, branding and marketing resources to flower farmers, florists, designers, retailers and wholesalers who wish to promote American grown Flowers. 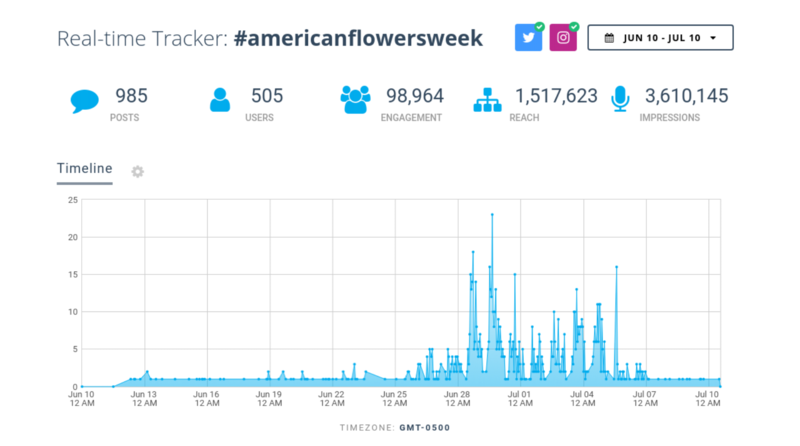 Even with those tracking limitations, you and your participation in American Flowers Week generated amazing numbers — 3.6 million impressions in the month leading up to the 2018 celebration. We know the real total engagement was much higher, due to tracking tools not being able to capture Facebook traffic. 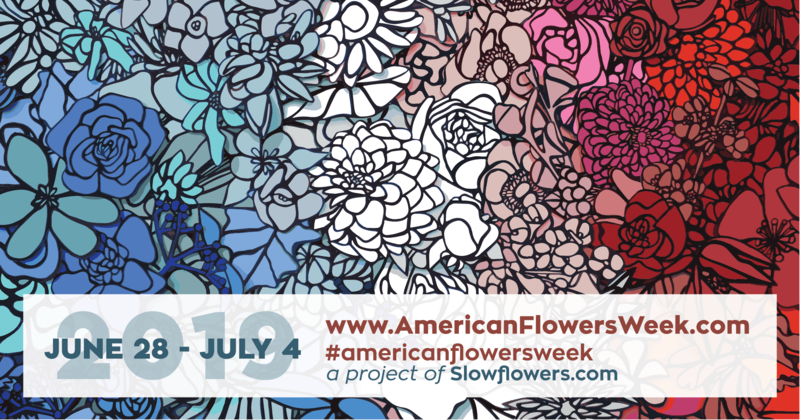 #americanflowersweek on Instagram this week! All I can say is THANK YOU to each one of you who joined in the fun by designing red-white-and-blue bouquets, taking photos and posting/tagging them as #local #american and #seasonal and #slowflowers. 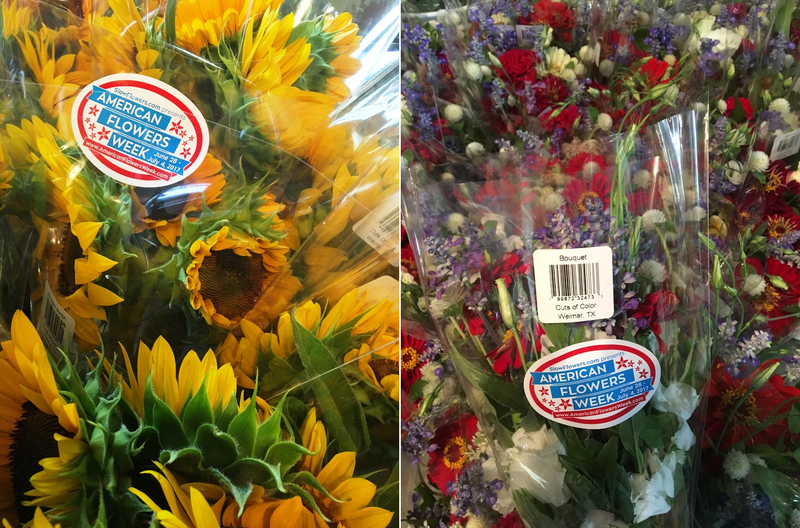 Rita Anders of Cuts of Color in Weimar, Texas, delivered American Flowers Week bouquets and bunches to Central Market stores in Houston. Thanks to those of you who ordered our bouquet labels to use on your market and grocery bouquets, and for CSAs and popup events. And thanks for building the buzz to raise awareness about the importance of conscious choices when it comes to buying flowers. The more fun and fashion we can share with flowers, the more their origin becomes a top-of-mind decision at the cash register. And speaking of fashion, 2018 was the third year of our American Flowers Week – floral fashion collection, a brilliant season of botanical garments revealing the beauty of flowers, the people who grow those flowers and the floral artists who reimagine them into garments. 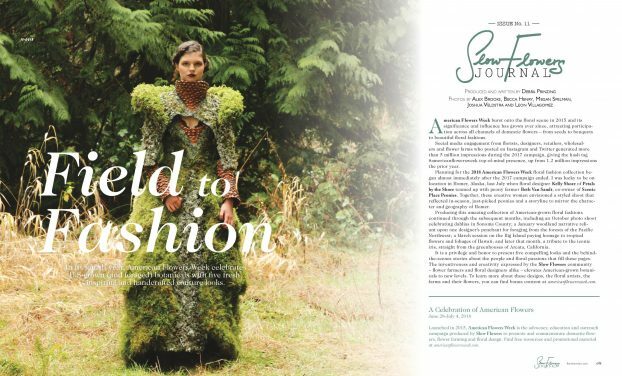 This year, we called the theme “Field to Fashion,” and revealed all five floral couture looks in the pages of Florists’ Review magazine. 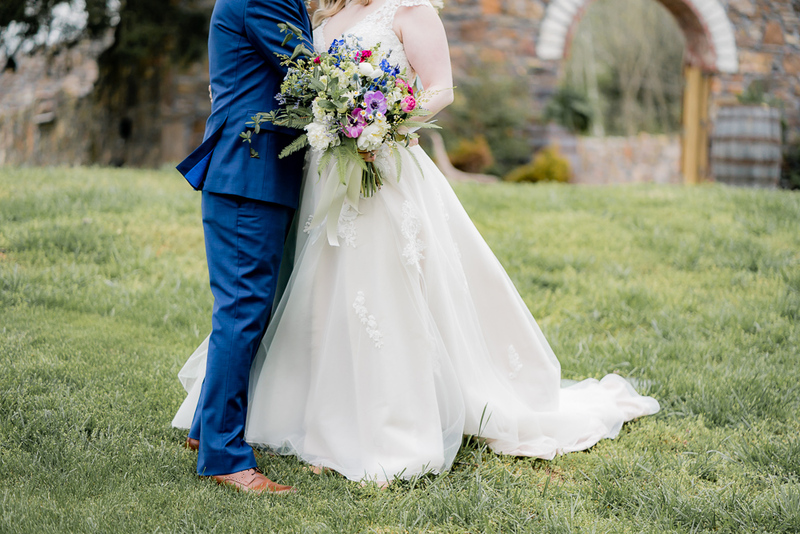 Producing this floral narrative began in Homer, Alaska, where Kelly Shore of Petals by the Shore partnered with Beth Van Sandt of Scenic Place Peonies to envision a styled shoot reflecting just-picked peonies with a storyline that reflects the character, history and geography of Homer. and Faye Zierer Krause of Flora Organica Designs’ tribute to the Iris, straight from the Sun Valley Flower Farms’ greenhouses of Arcata California. 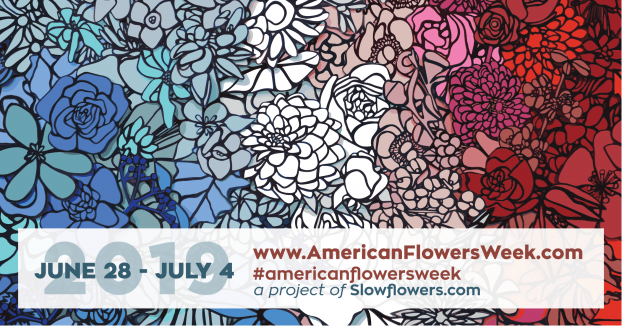 It is a privilege and an honor to experience this level of creativity and commitment to American Flowers Week. The inventiveness expressed by the Slow Flowers community — flower farmers and floral designers alike — elevates American-grown botanicals to new levels. 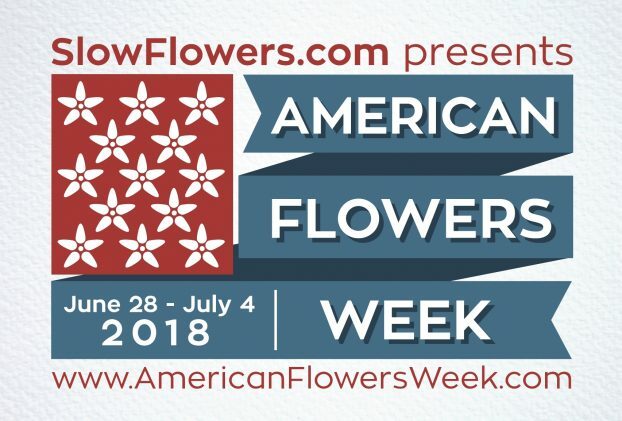 Click here to find the photos of the entire 2018 American Flowers Week collection of botanical fashions, including the stories behind each look. I also need to thank and acknowledge the talented photographers who made each of these beautiful ideas come to life through their lens, including Alex Brooks, Becca Henry, Megan Spelman, Joshua Veldstra and Leon Villagomez. 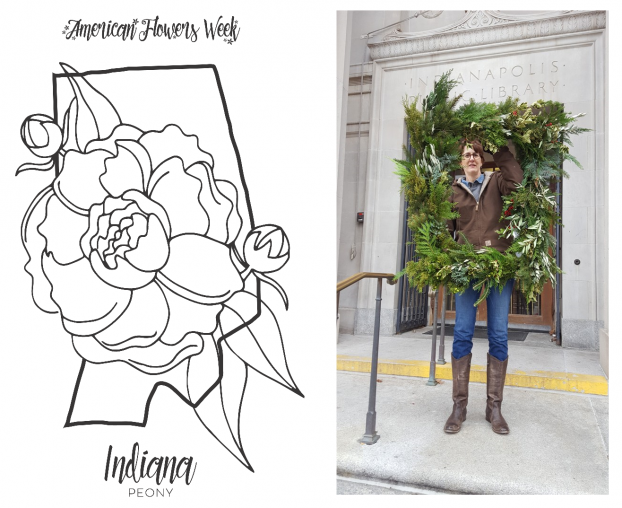 Botanical artist Ellen Hoverkamp created our American Flowers Week 2018 image and branding! One more artist gets a big thank you for helping make American Flowers Week more beautiful – and that is Ellen Hoverkamp of My Neighbors’ Garden. We invited Ellen, a Connecticut-based artist, to create a red-white-and-blue bouquet using her signature scanner photography technique and the result was a stunning image that helped us promote the campaign all year long. 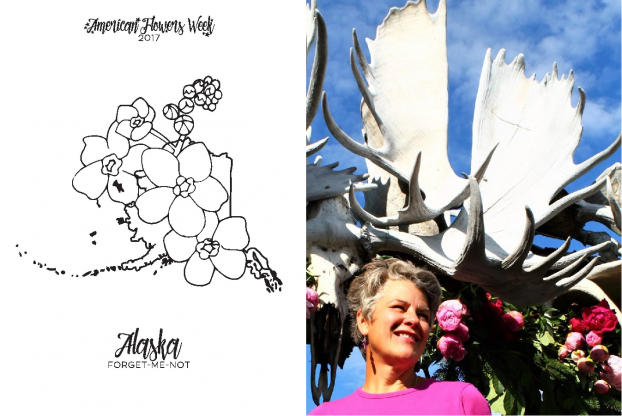 Her all-American botanical tribute wowed everyone and I’m excited to be able to use American Flowers Week as a way to highlight the work of such a talented artist. 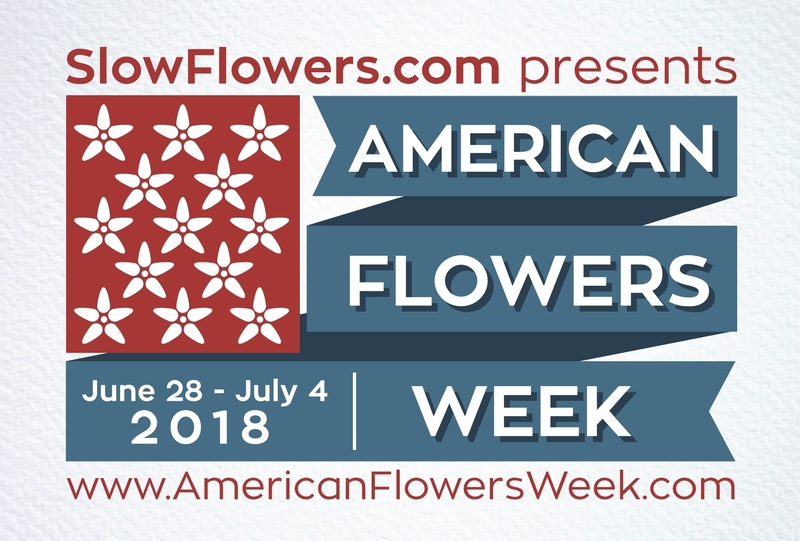 And now’s the time to mark American Flowers Week 2019 on your calendar — June 28 through July 4 — because it will be our fifth annual campaign celebration! I’ll have more to share in the coming months, but you are invited to check out two links I’ll share in today’s show notes — first, a look at the 2019 botanical art branding we commissioned from Josephine Rice, and second, a sneak peek to introduce the florists and flower farmers who are busy creating American Flowers Week botanical fashions for next year’s editorial package.